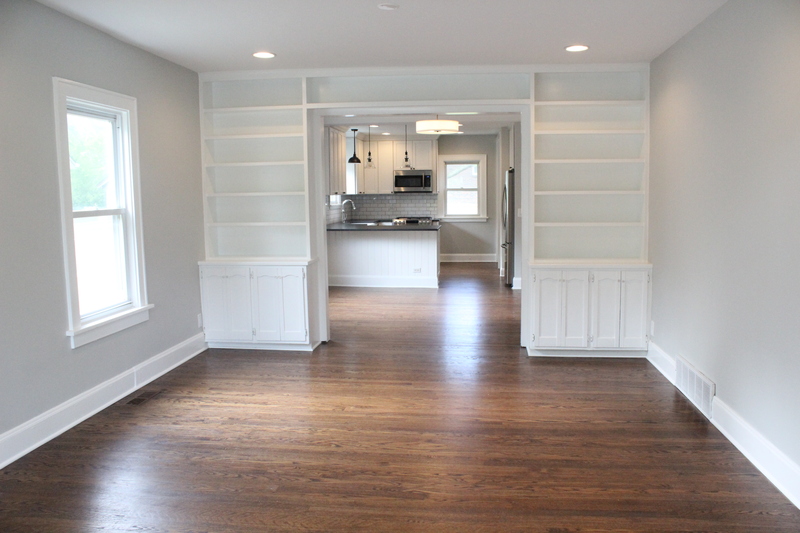 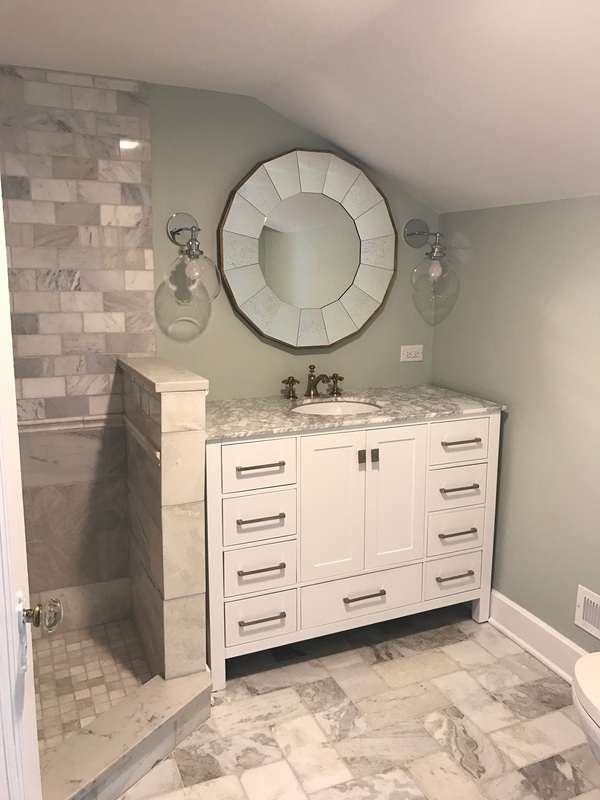 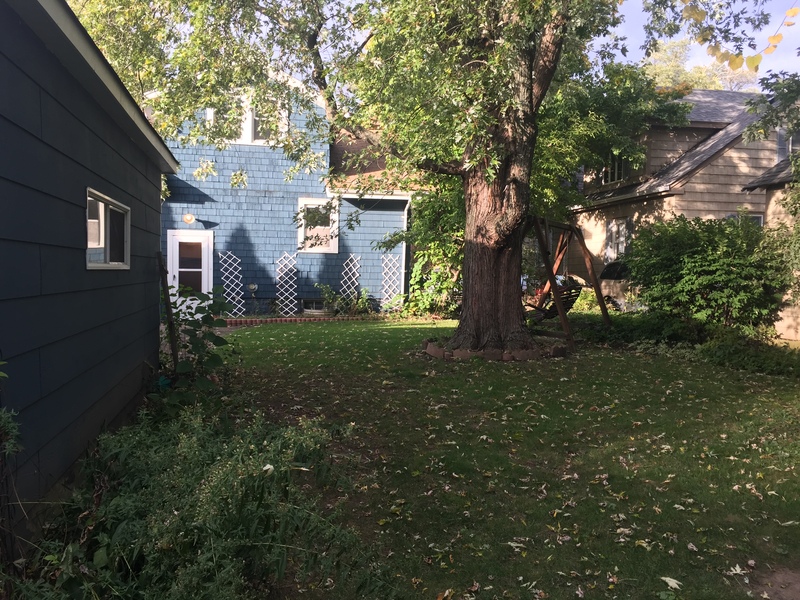 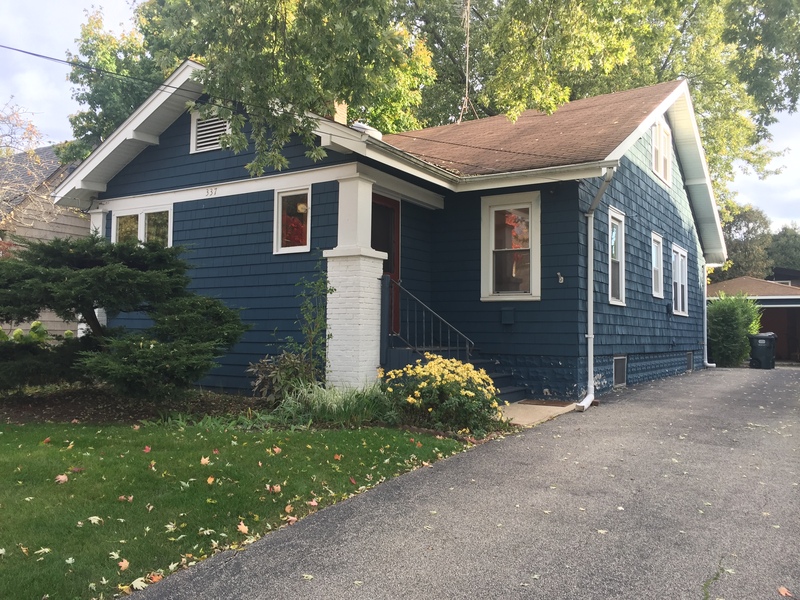 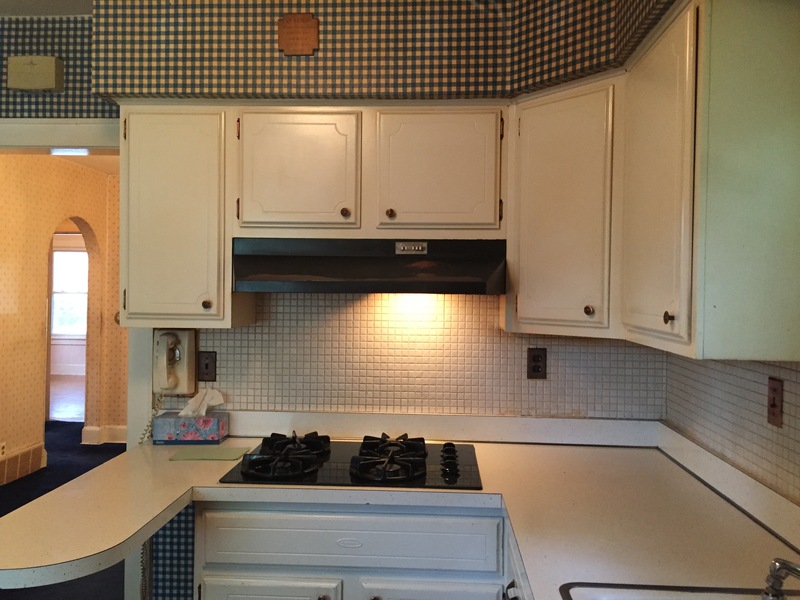 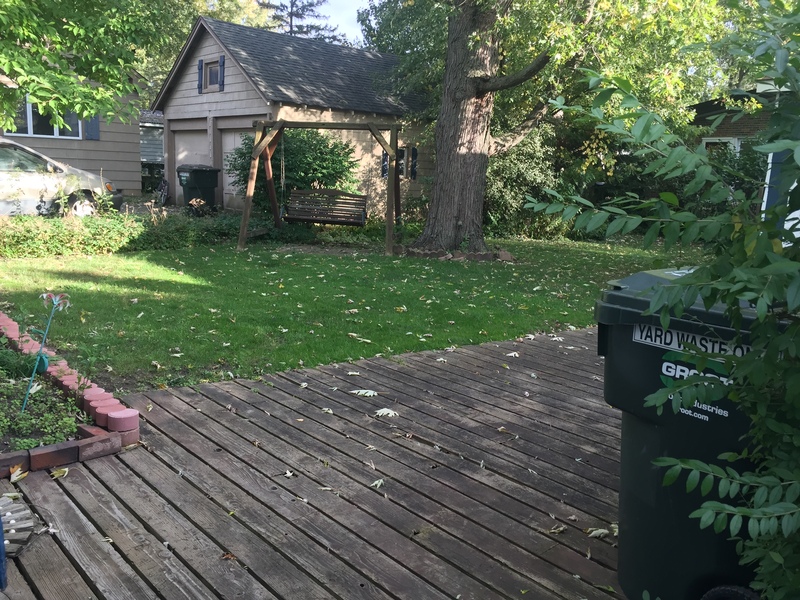 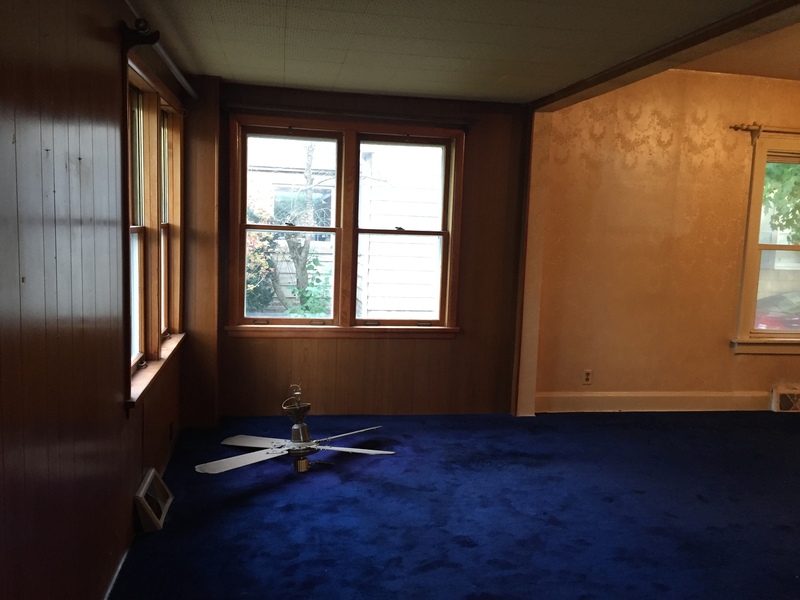 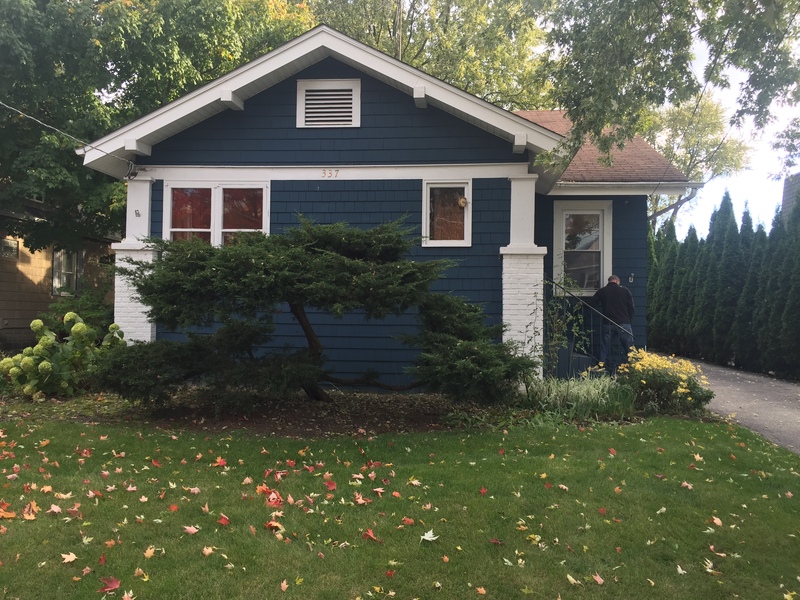 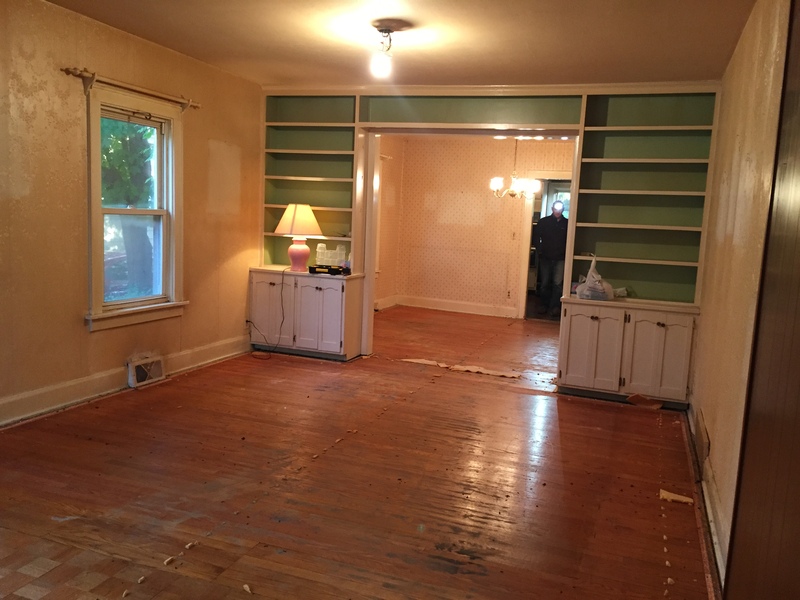 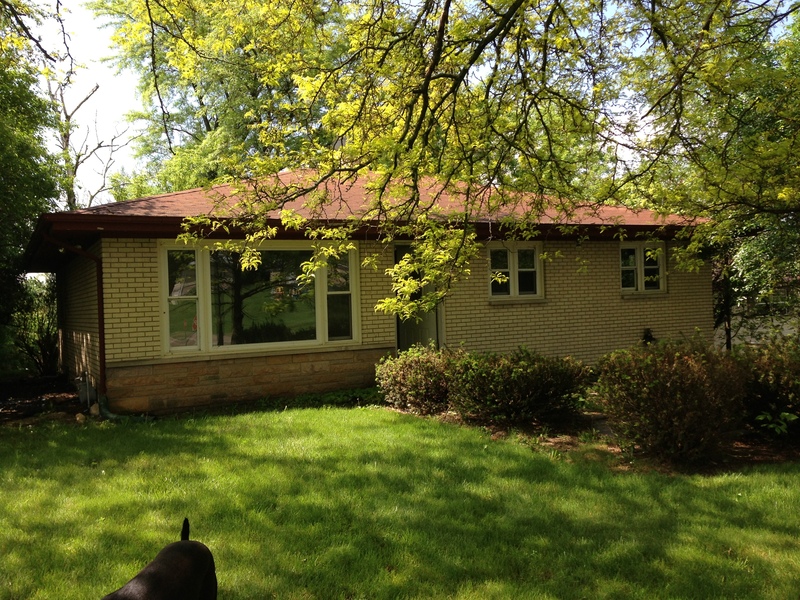 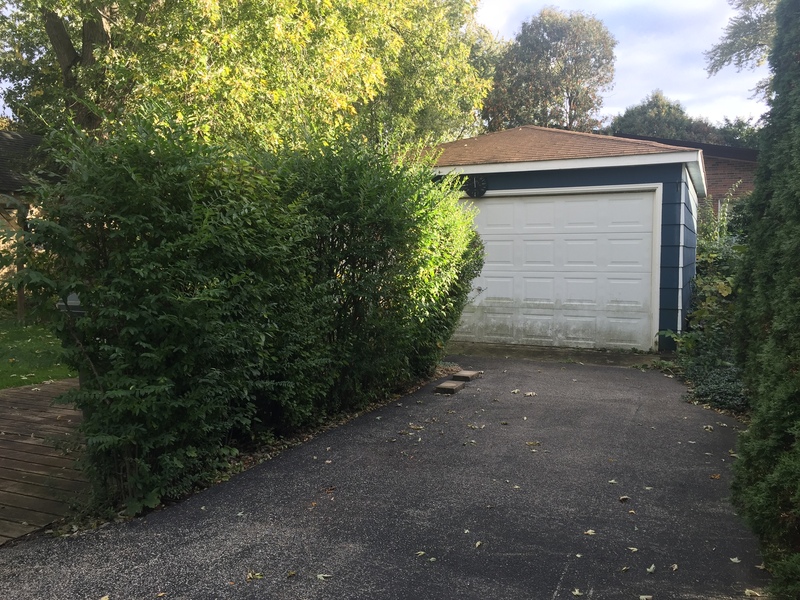 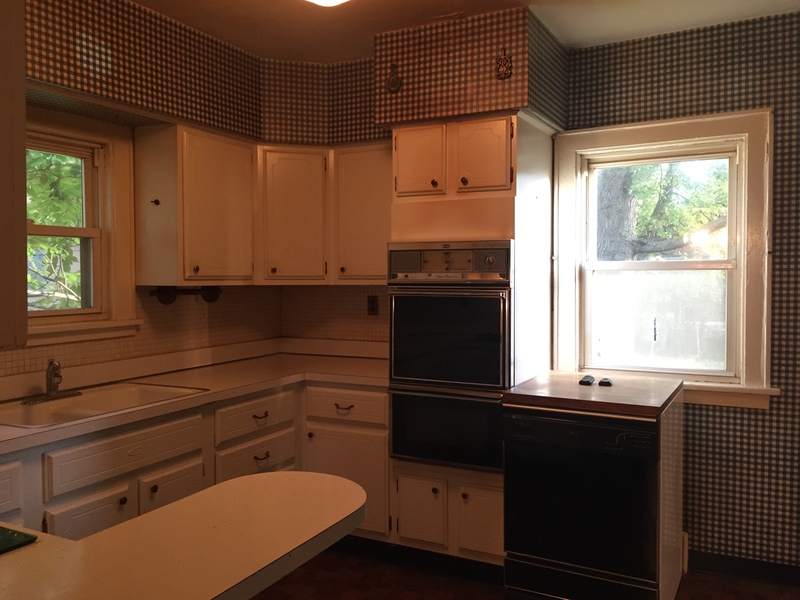 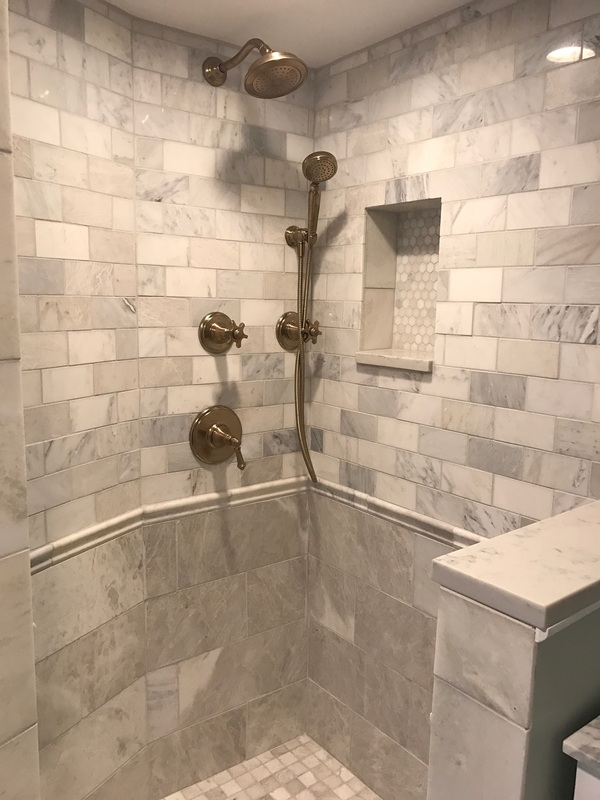 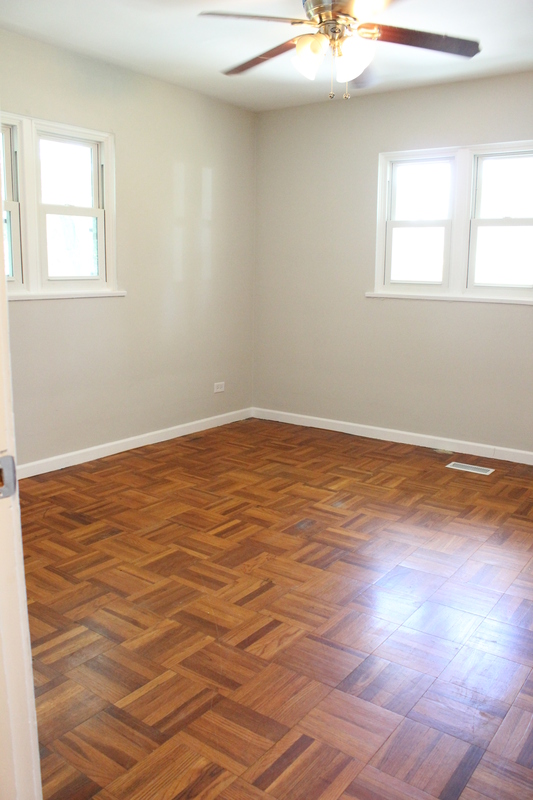 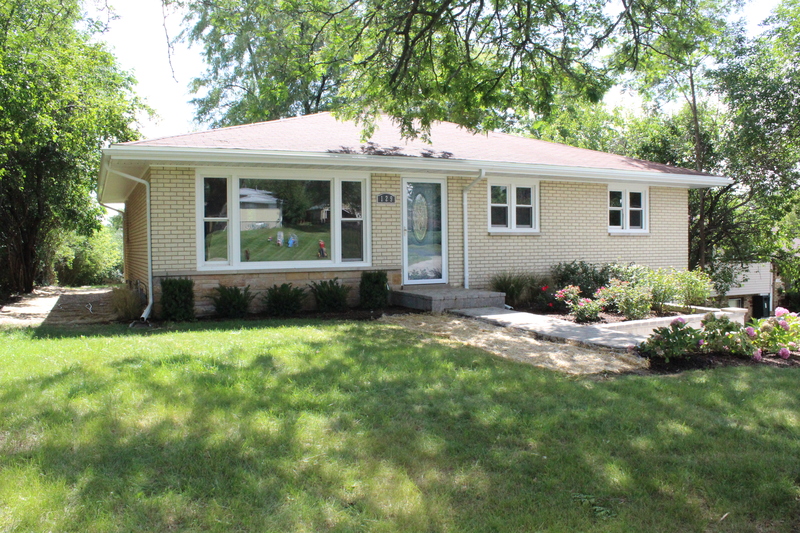 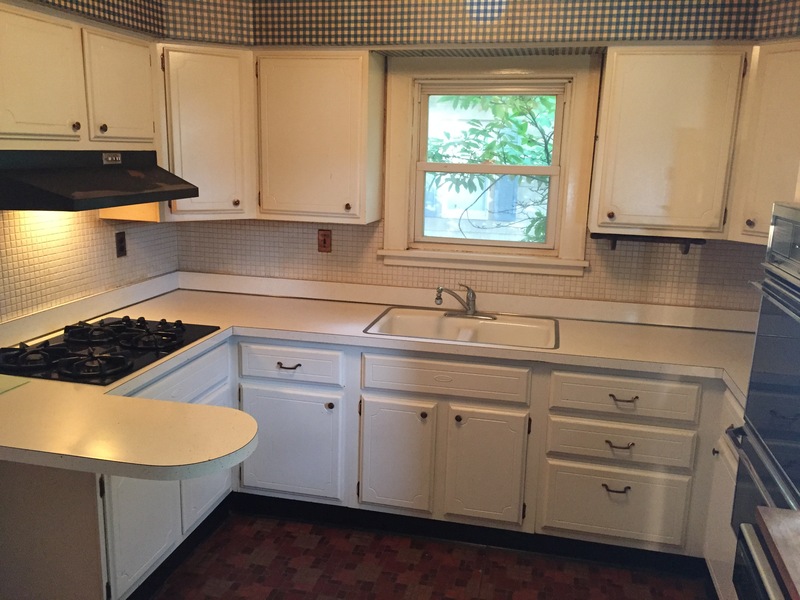 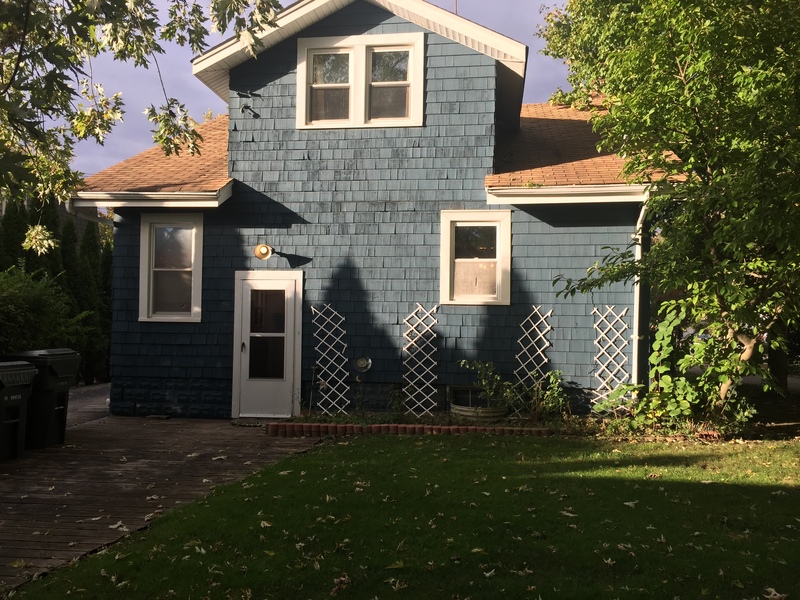 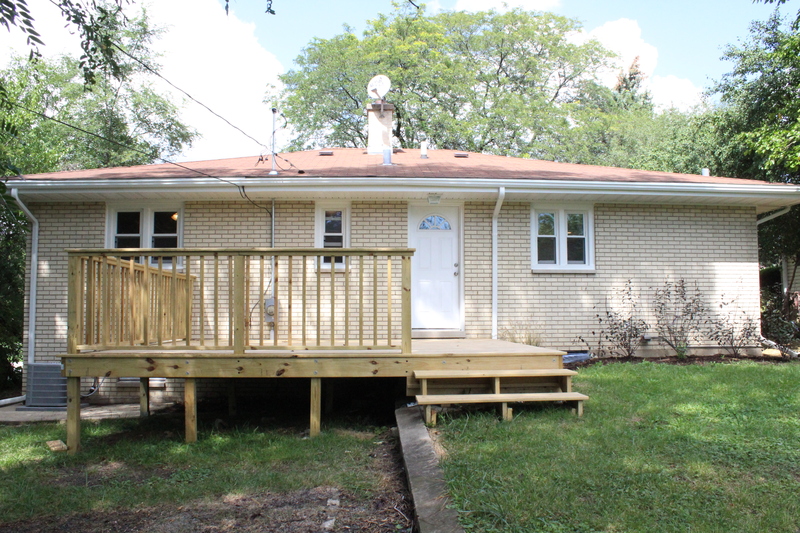 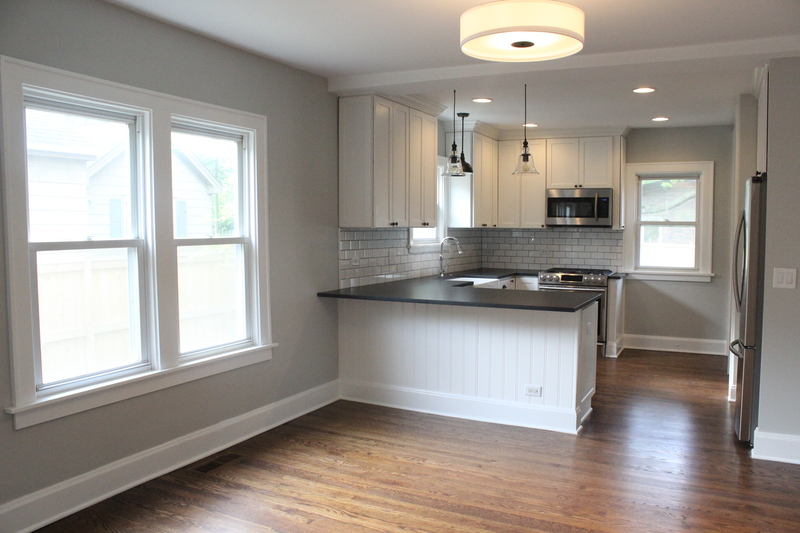 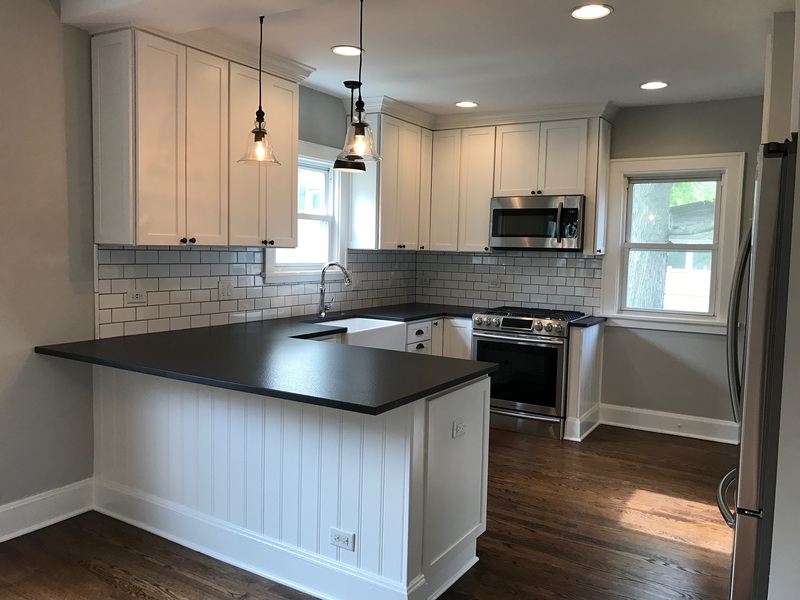 Last October, I shared a new “flip” property that we purchased— a 1931 Montgomery Ward home in our old neighborhood that had so much charm but needed to be brought back to life. 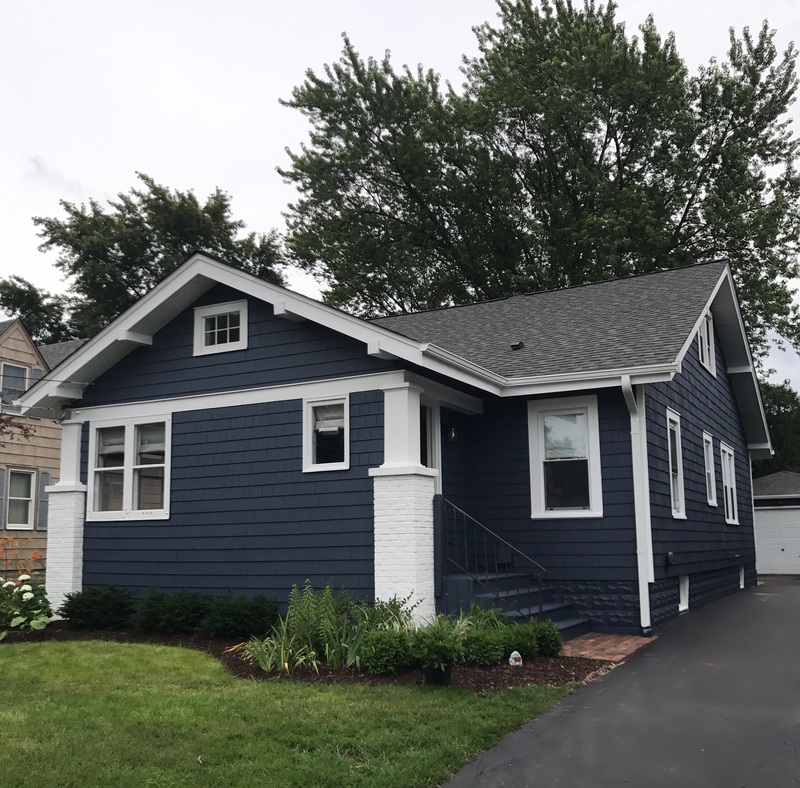 After a pretty grueling 7-month renovation, we sold it in May (to our good friends actually), and now here is the finished tour! 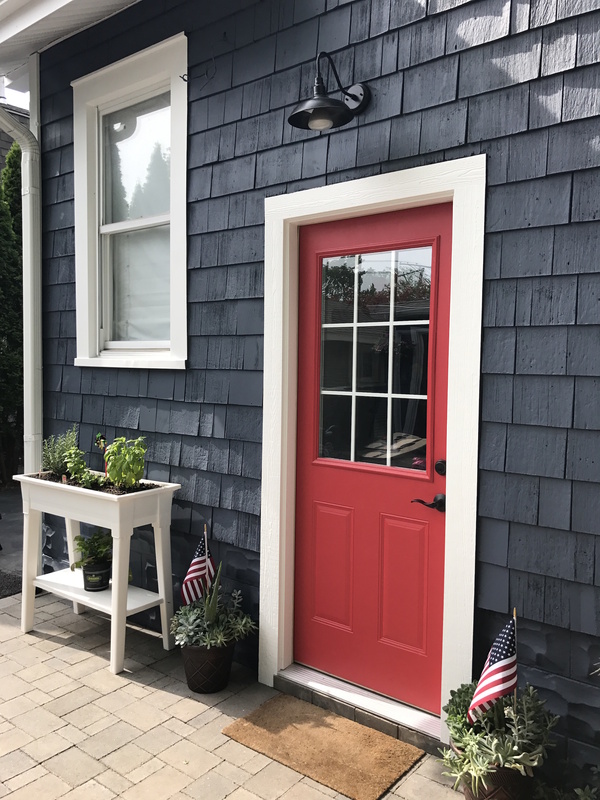 The homeowners choose this fun Poppy color for the front and back doors! 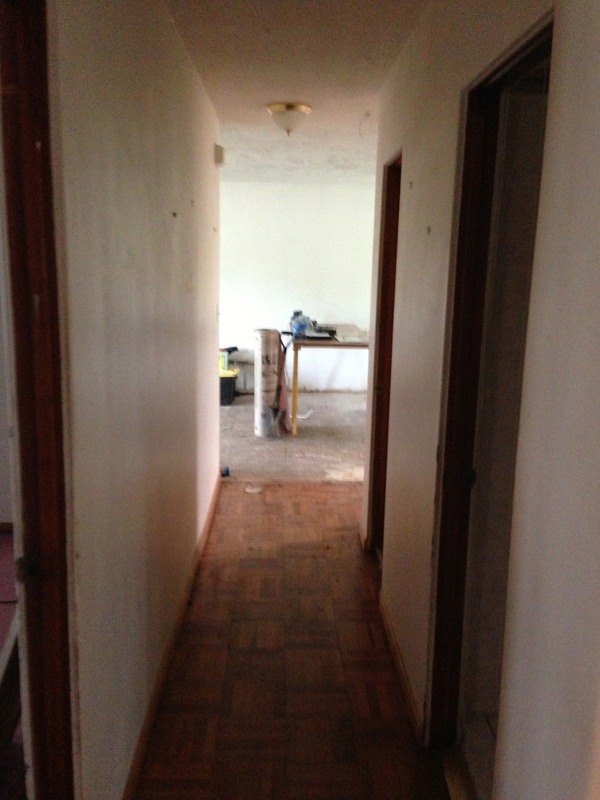 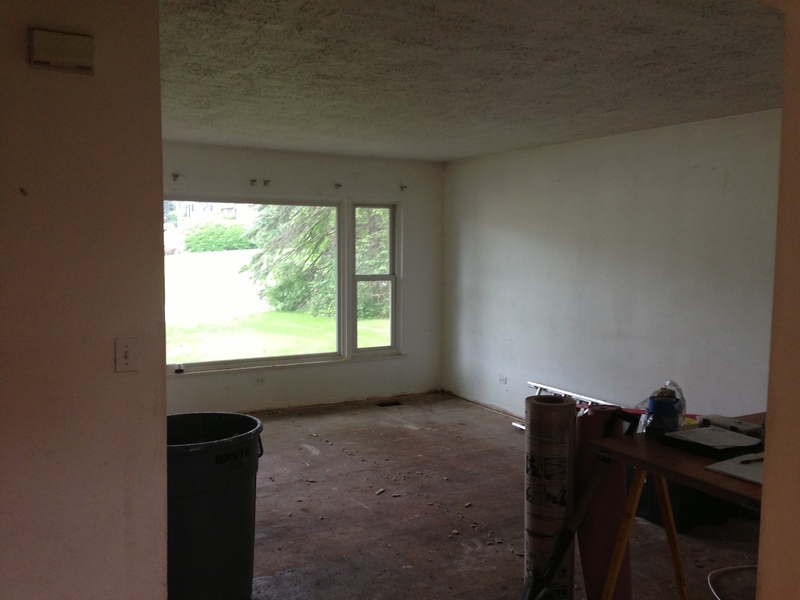 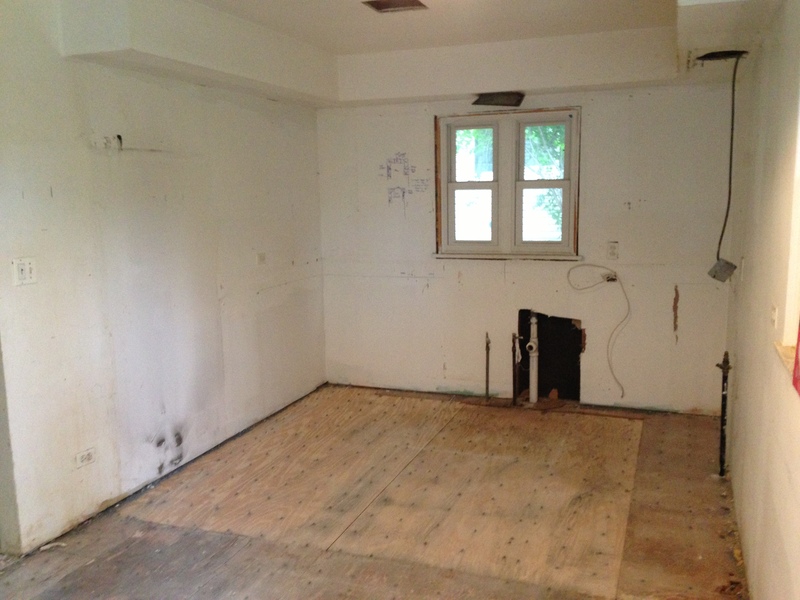 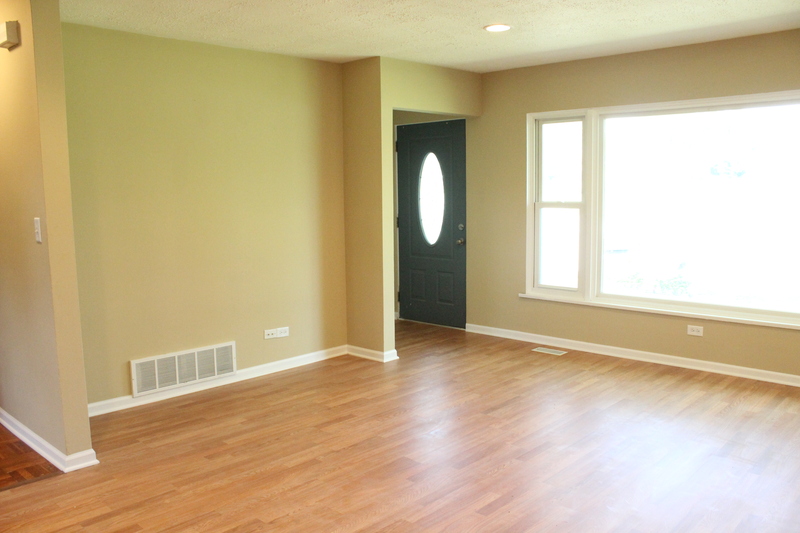 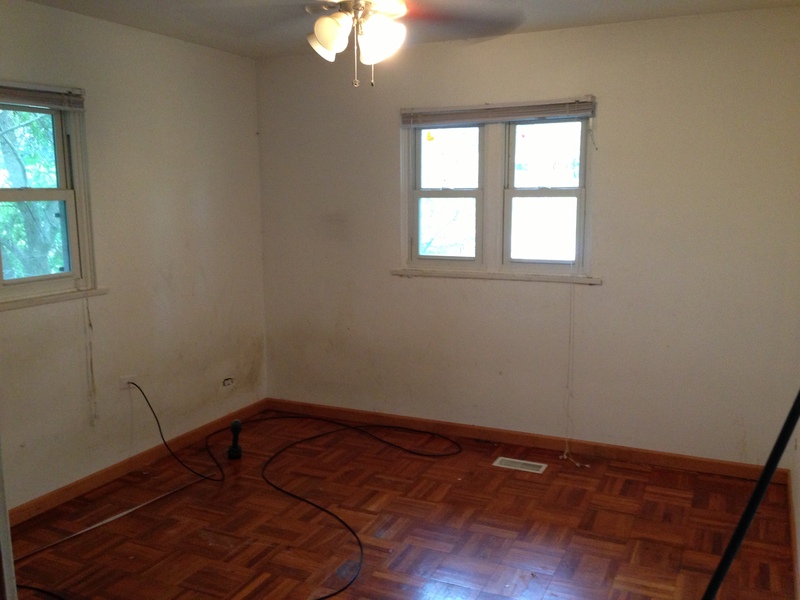 Moving inside, here was the old front room (it used to be a front porch). 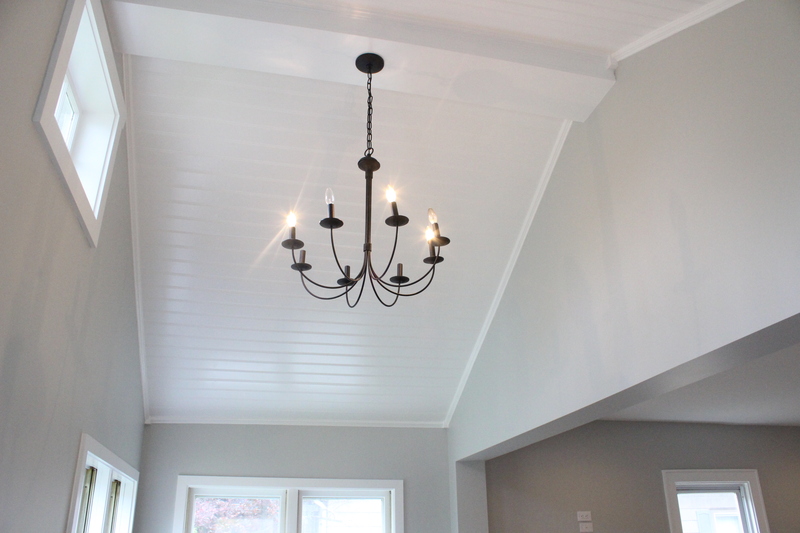 The beadboard ceiling and chandelier is probably my favorite part of the whole house. 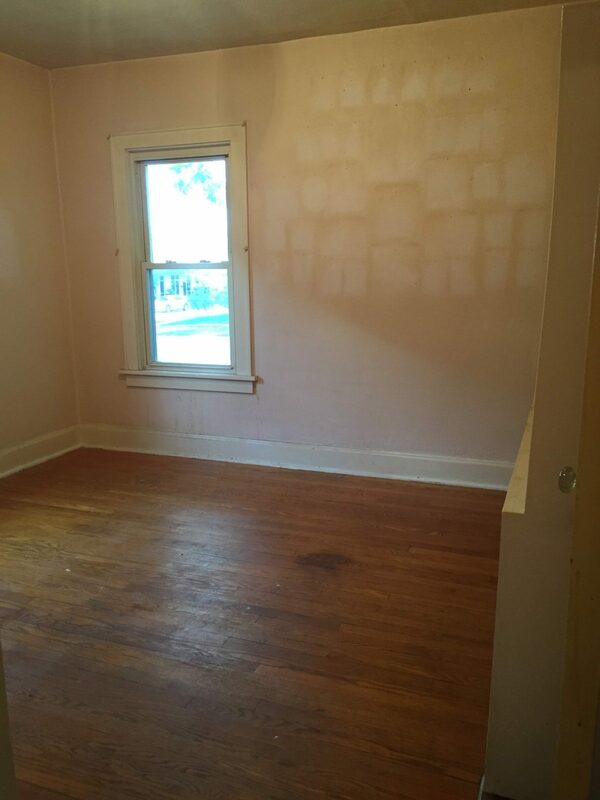 Such a huge transformation! 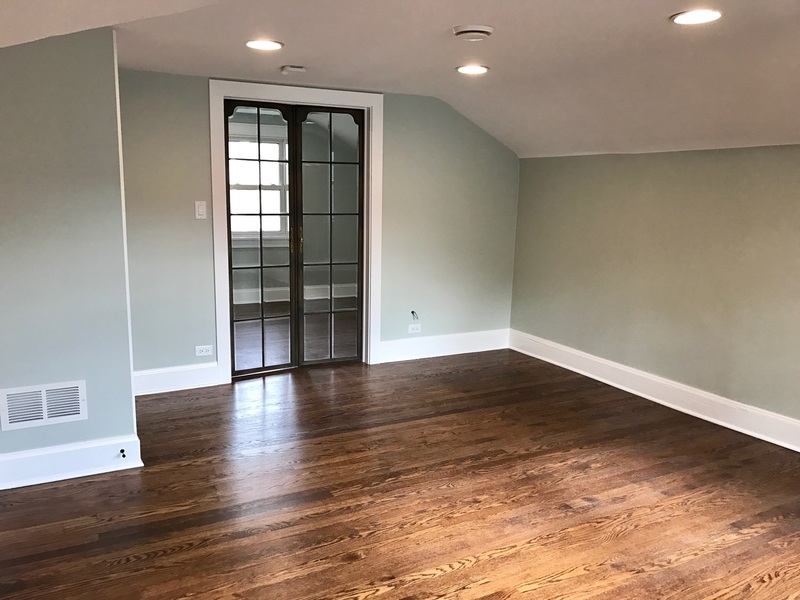 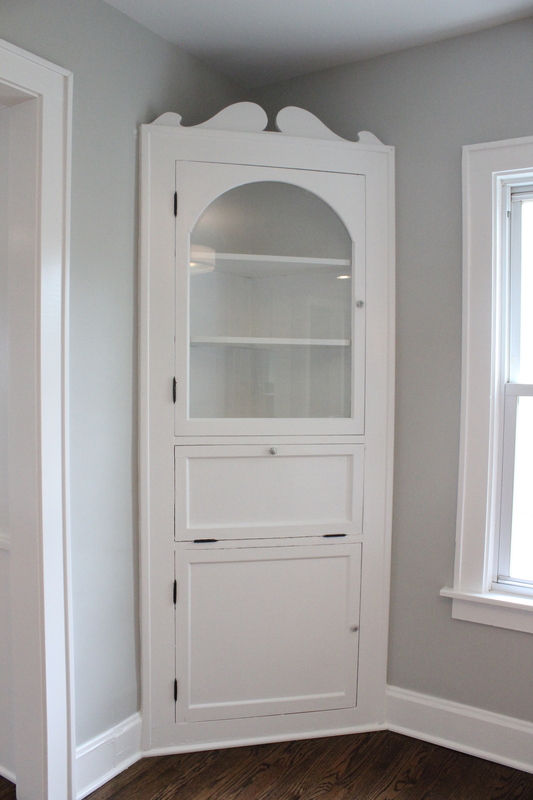 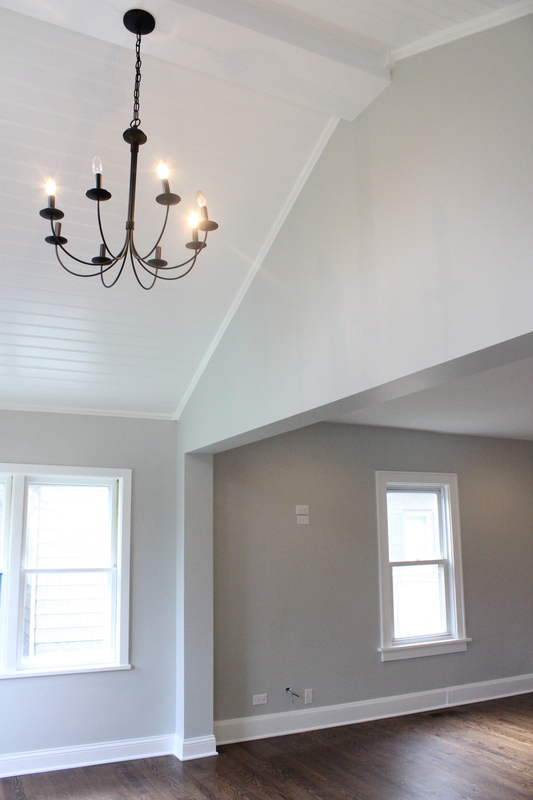 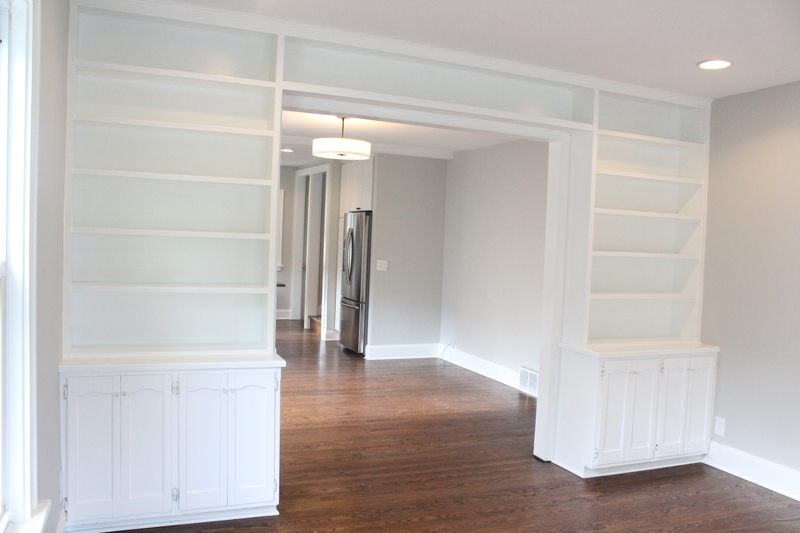 The built-ins give so much character, and they cleaned up so well with fresh paint (Chantilly Lace by Benjamin Moore)! 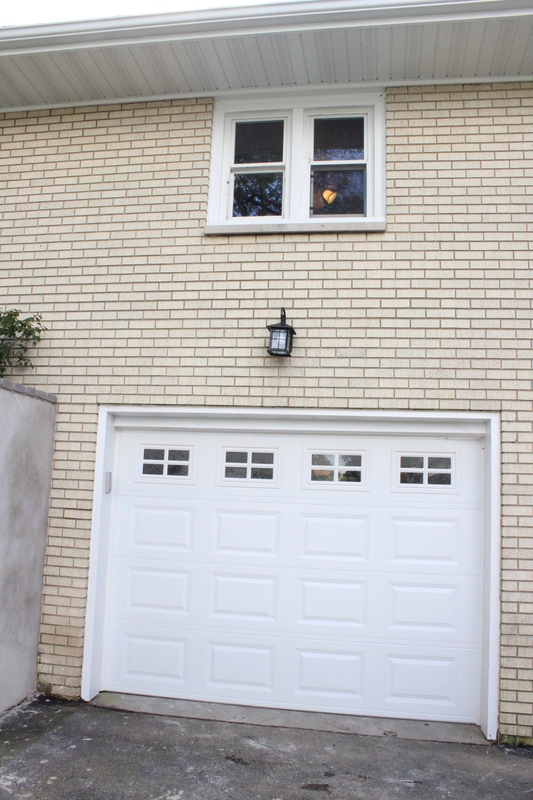 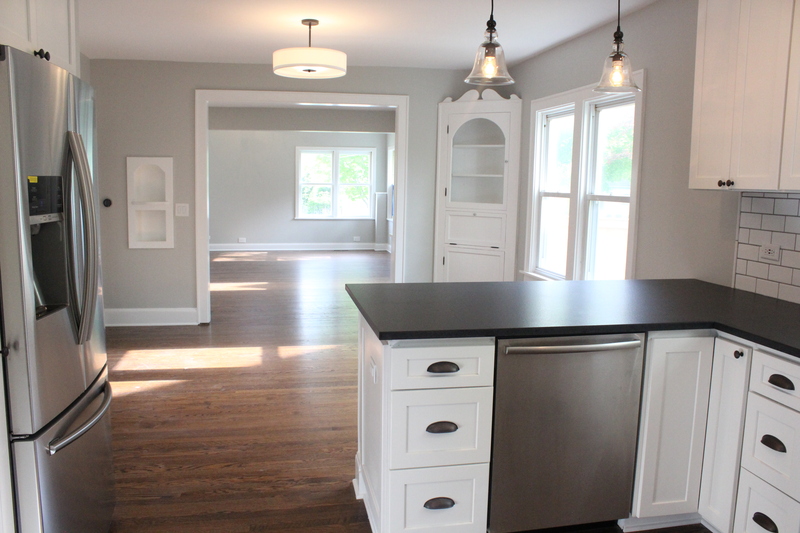 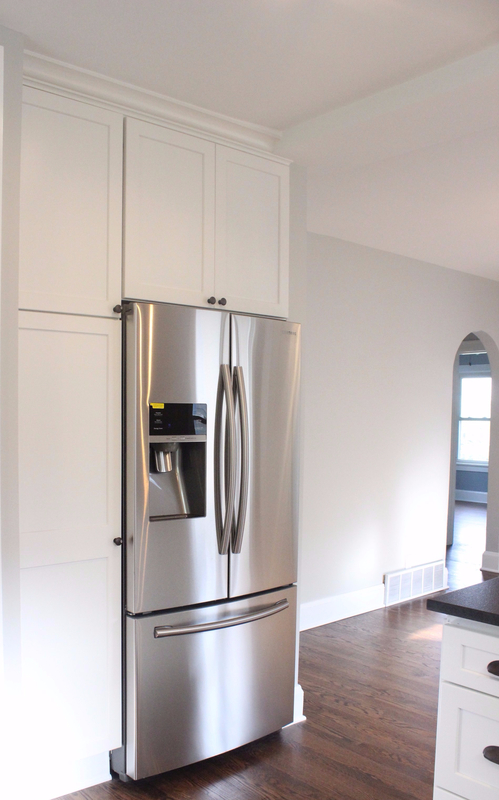 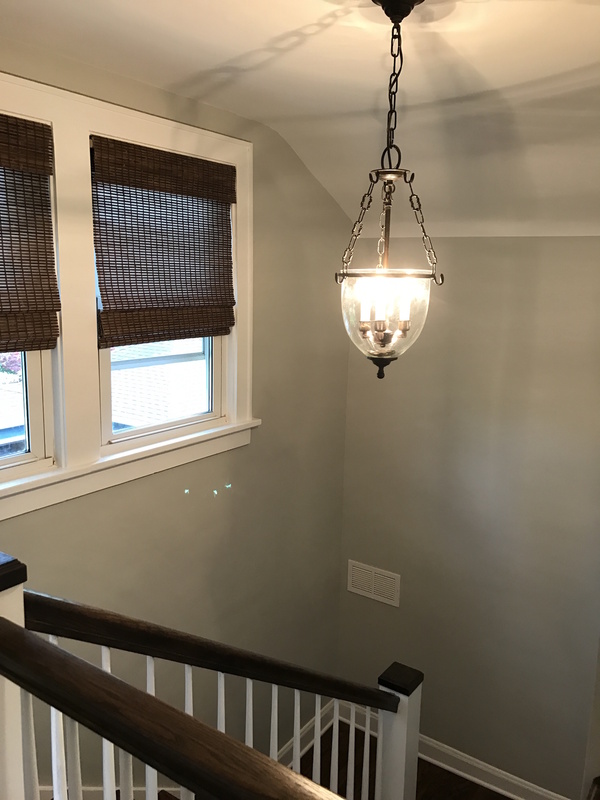 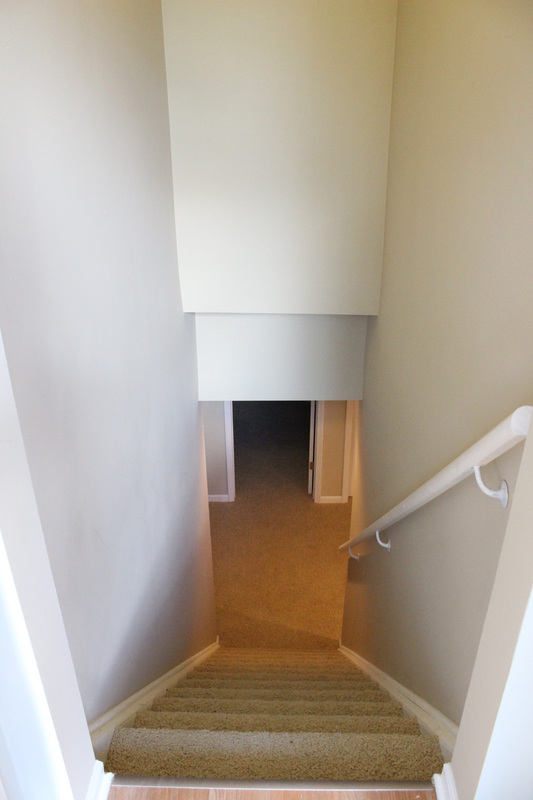 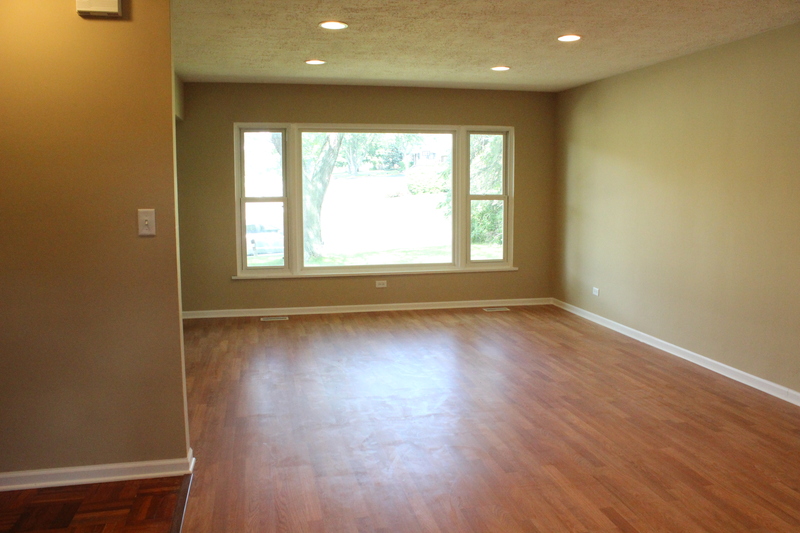 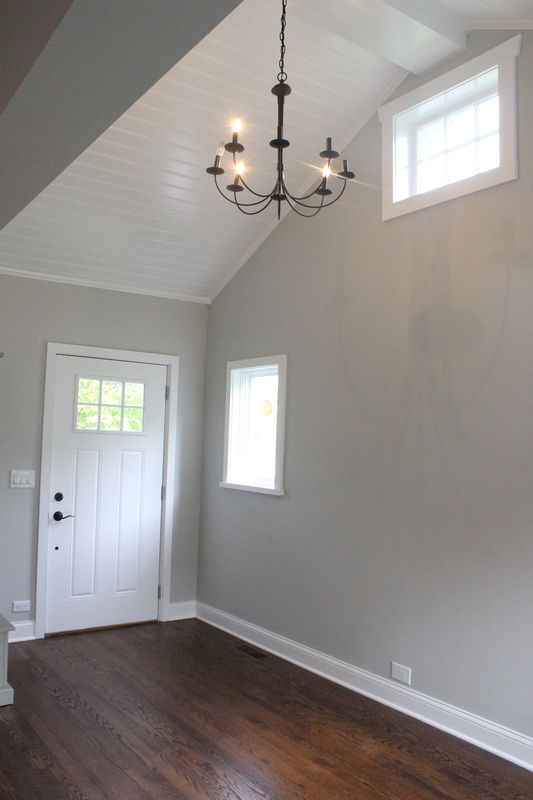 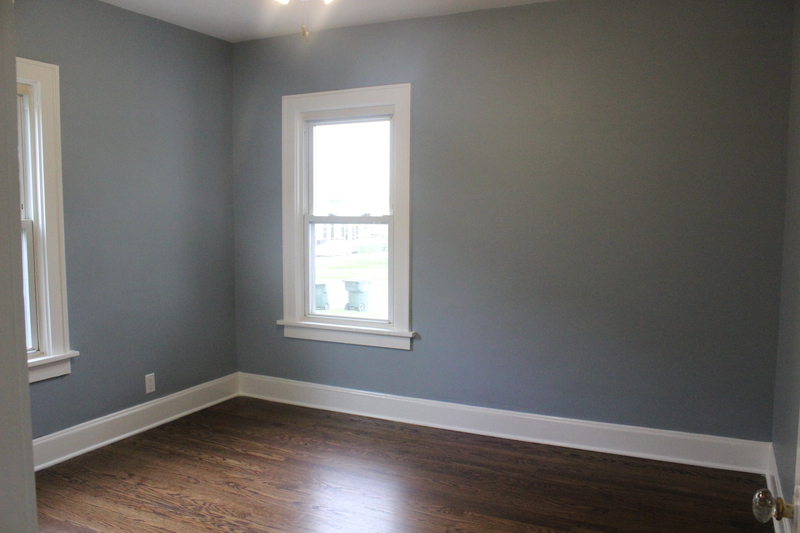 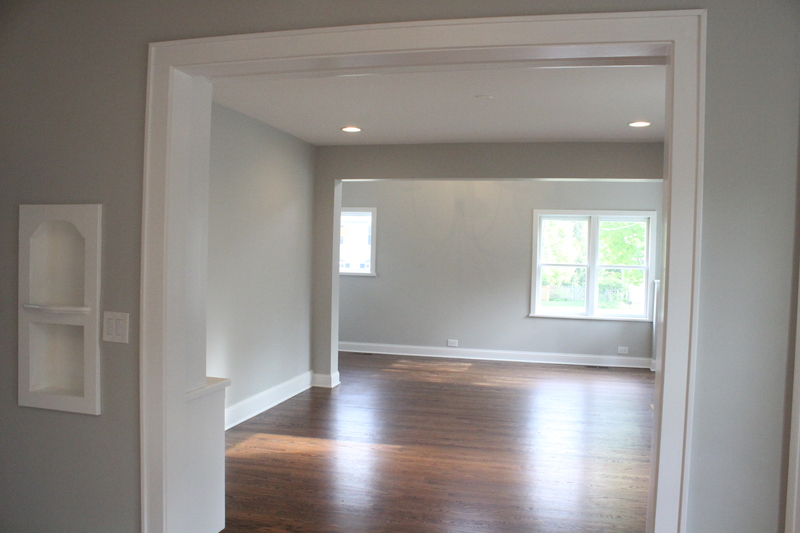 The paint color on the whole first floor is Gray Owl by Benjamin Moore— my favorite warm, medium gray. 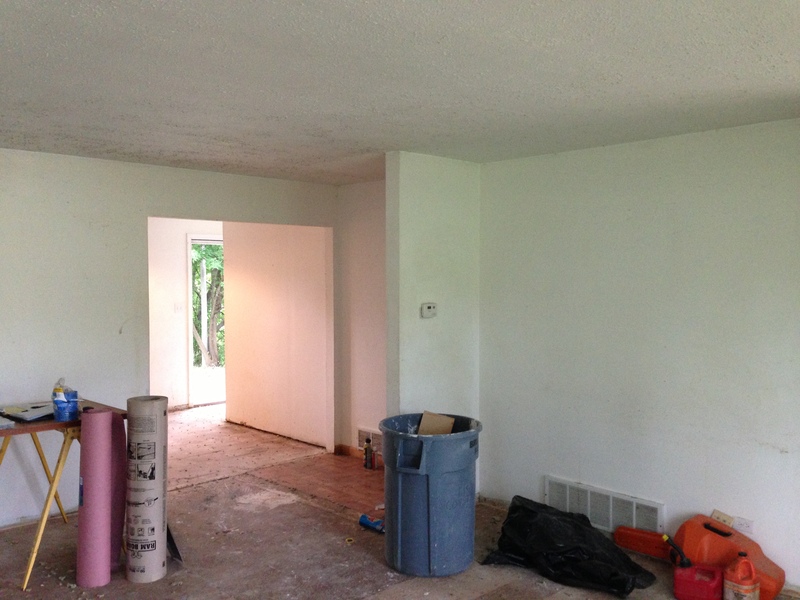 Here’s a look back through to the front of the house from the dining room. 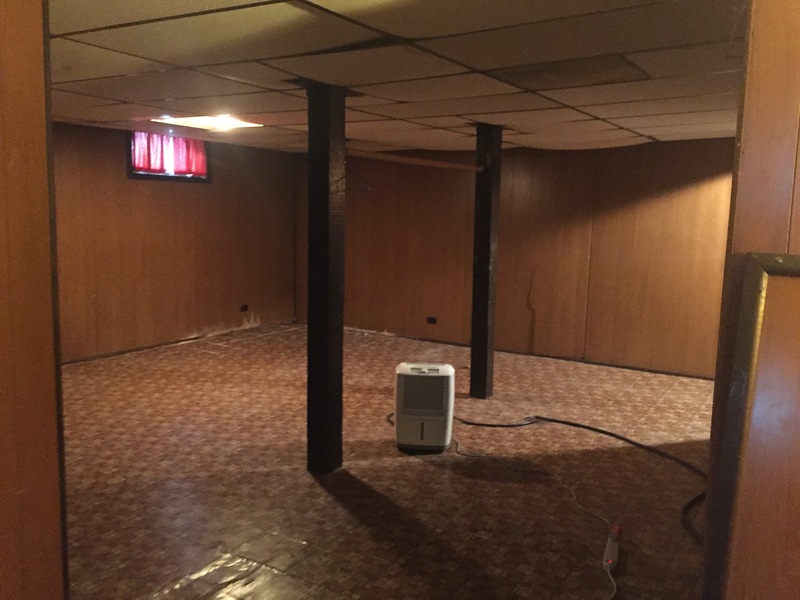 We totally changed the layout upstairs. 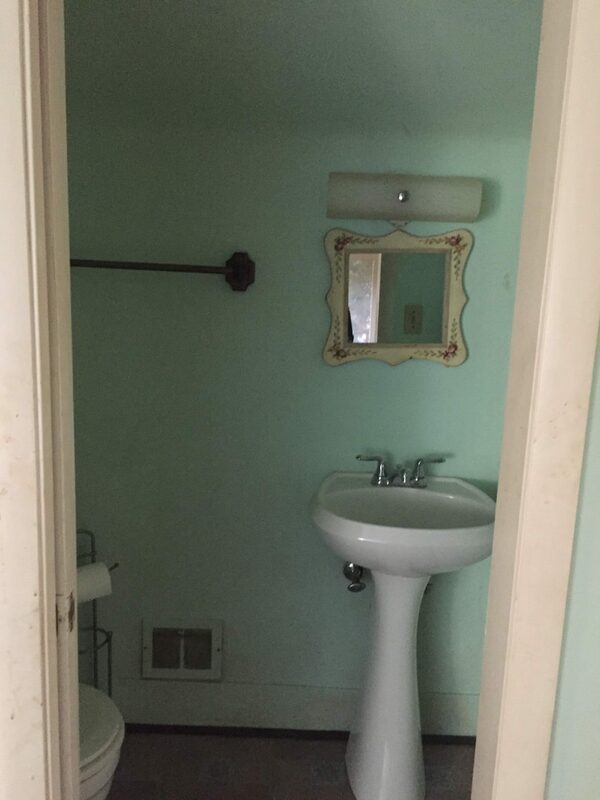 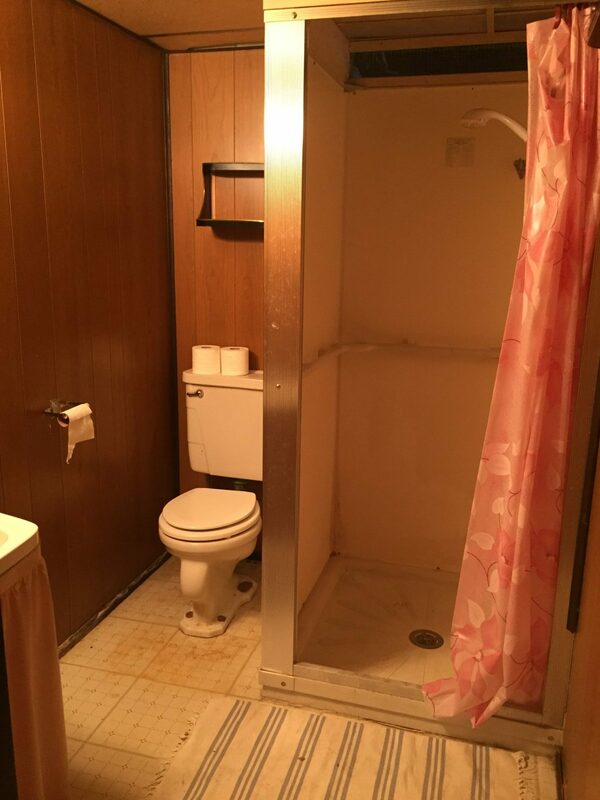 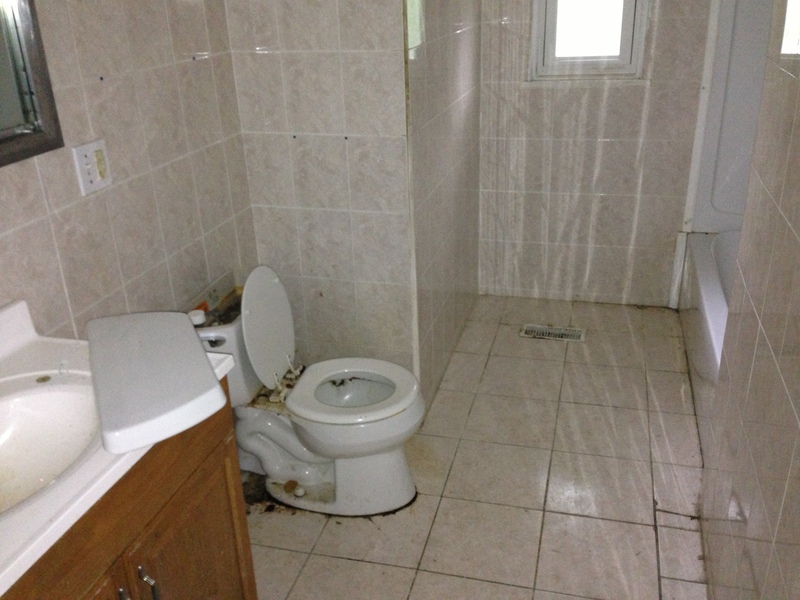 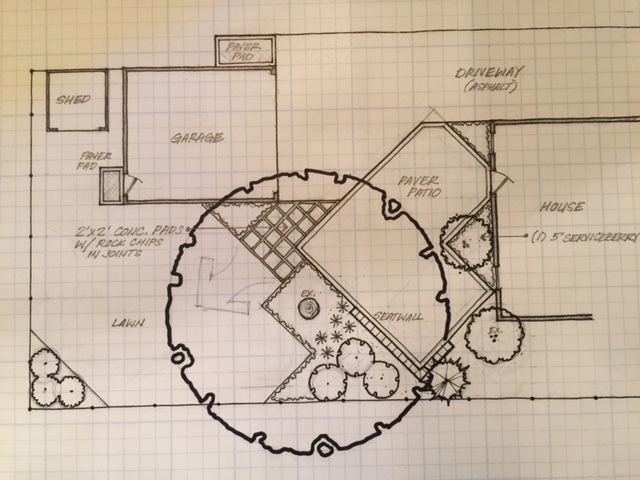 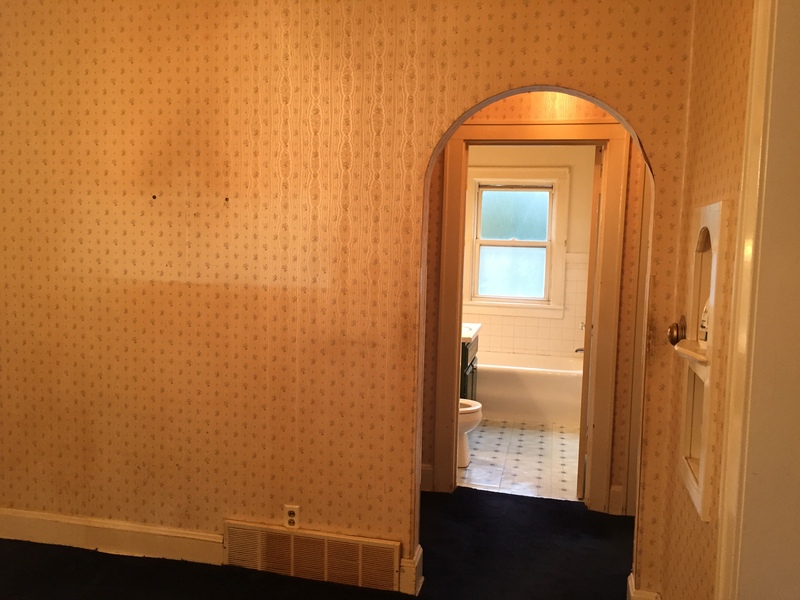 It used to be 2 small bedrooms and a TINY powder room. 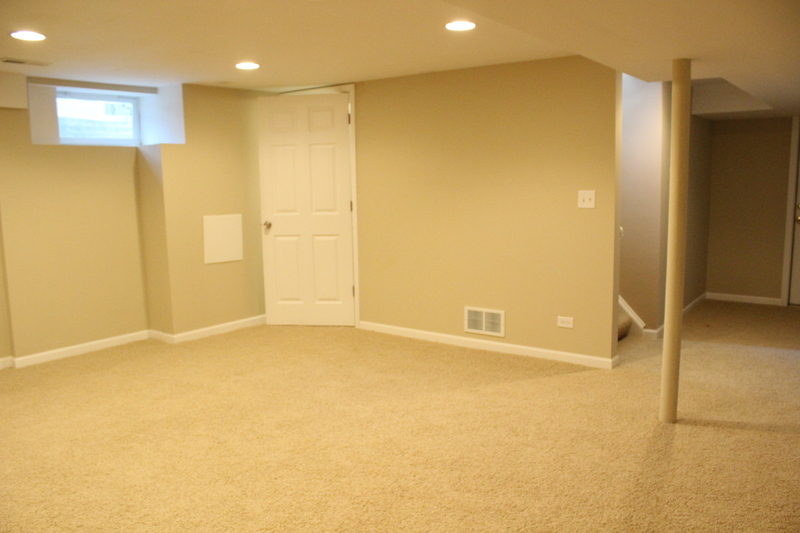 We changed it into one big master bedroom, walk in closet and master bath. 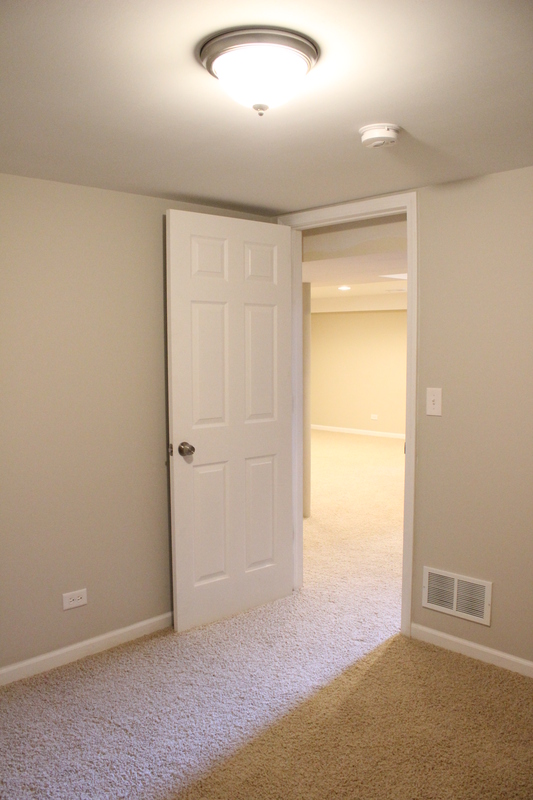 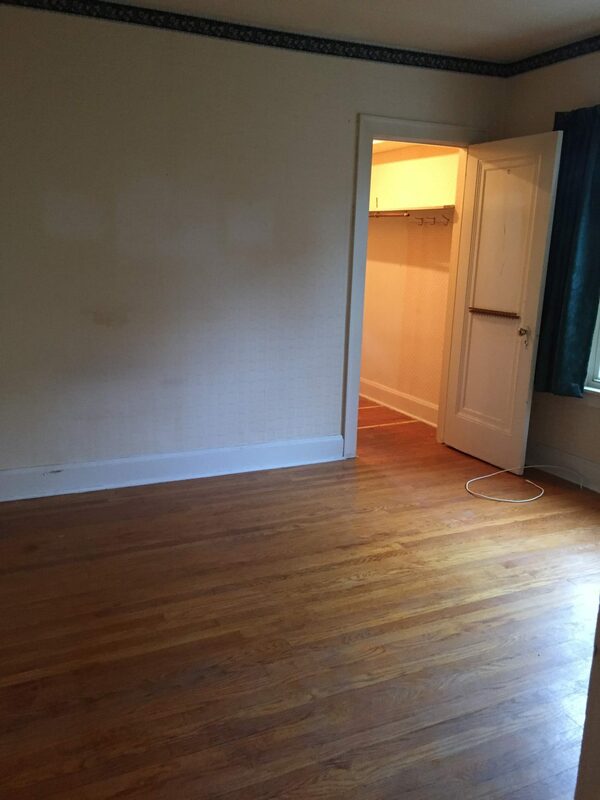 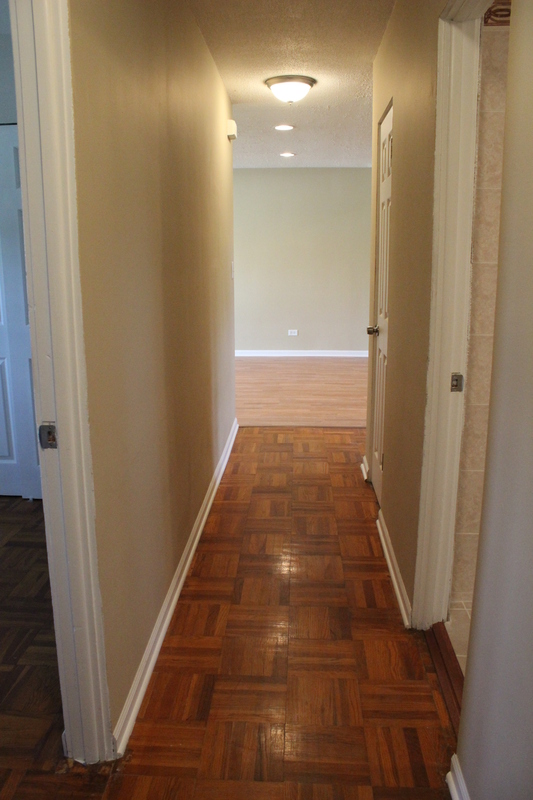 Aren’t those doors leading to the walk-in closet AMAZING? 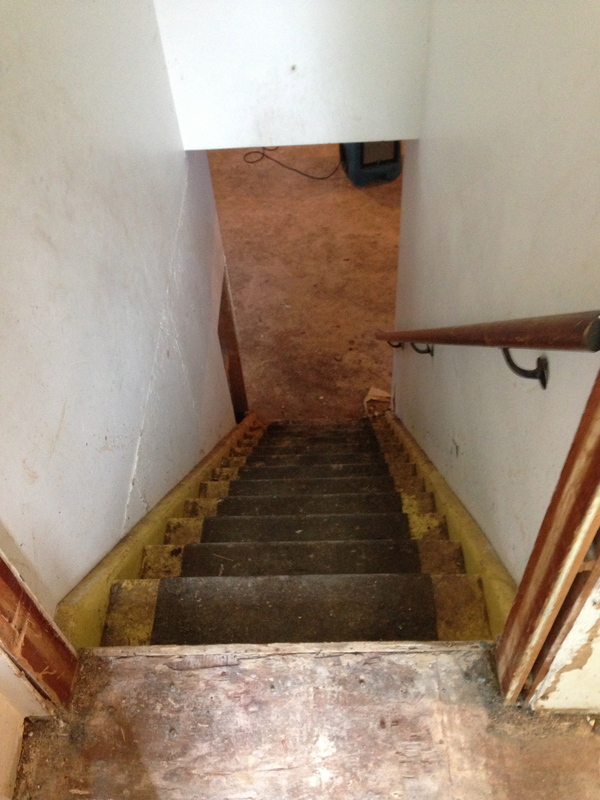 The homeowners found them at a salvage shop. 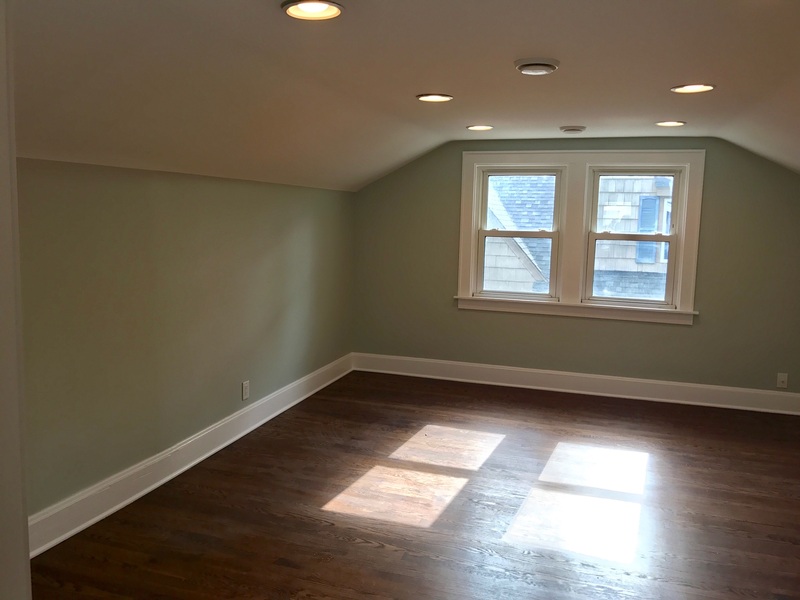 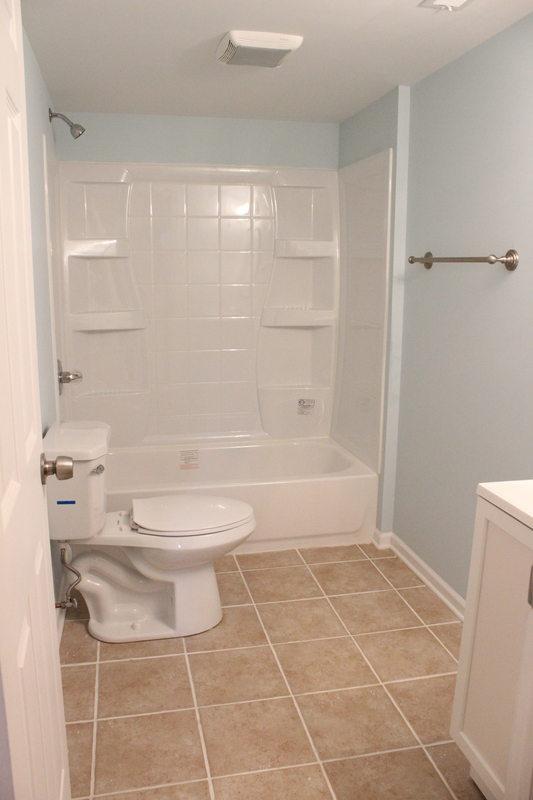 We added recessed lighting, re-finished the floors, and painted the walls Sea Salt by Sherwin Williams. 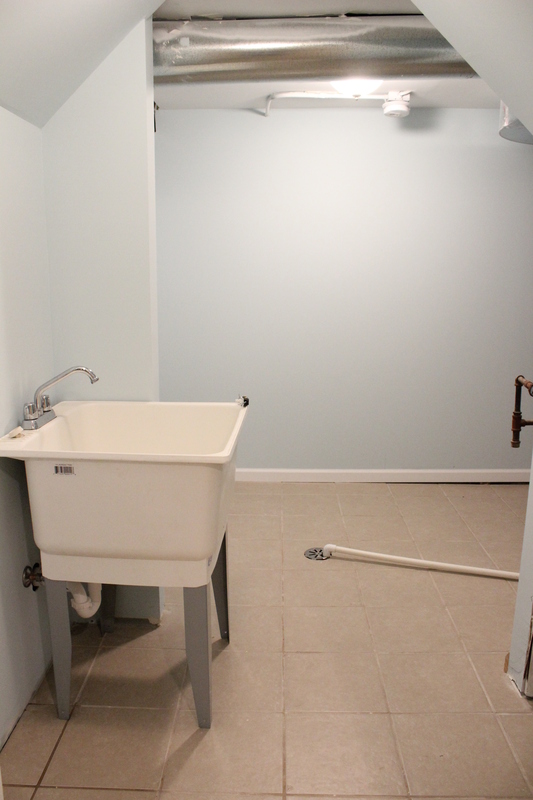 (The glass shower doors went in after I took these pics). 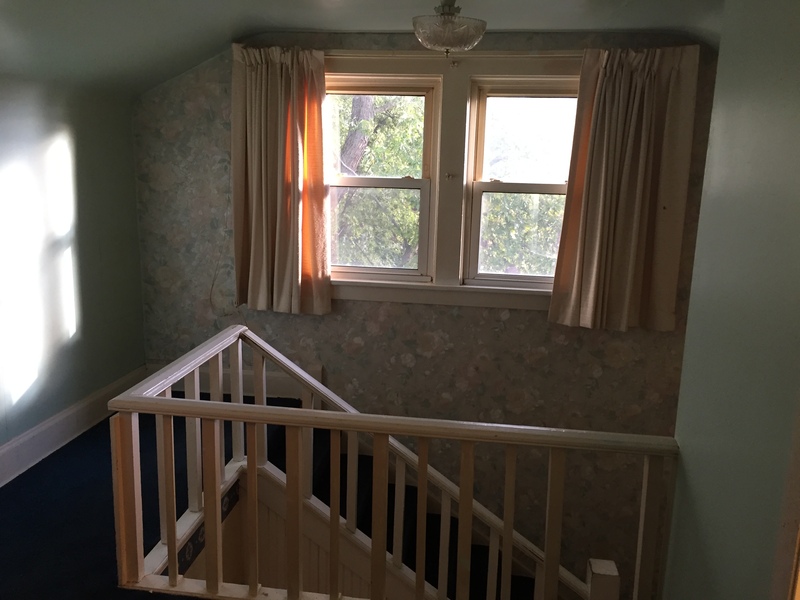 I really love how the whole upstairs is their master retreat. 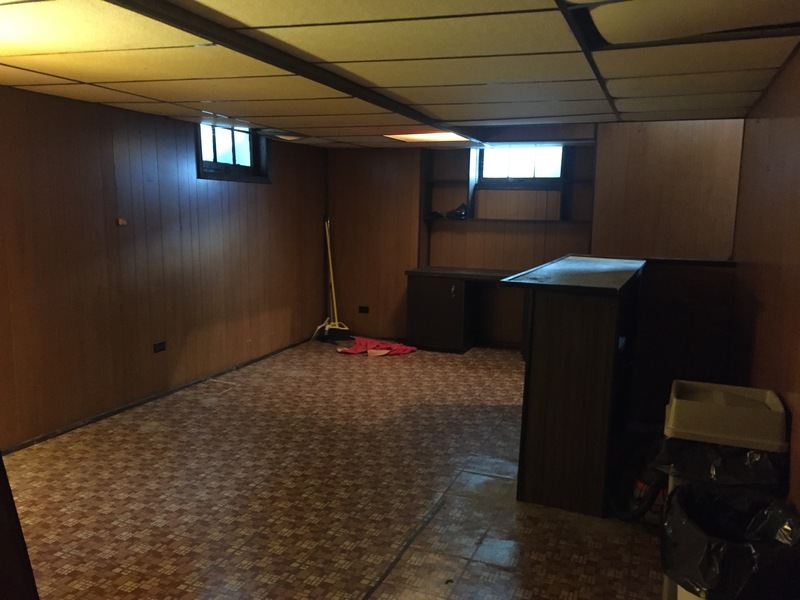 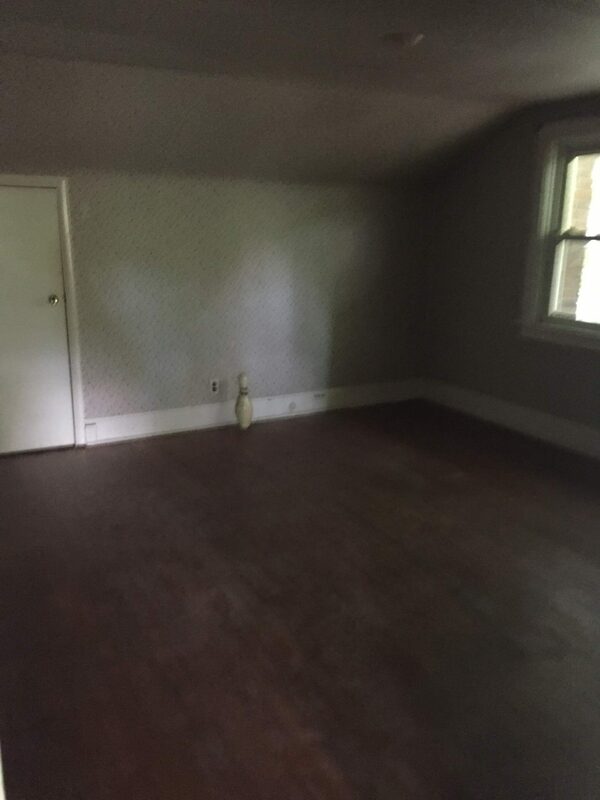 Moving down to the basement, it was straight out of the 1970’s with wood paneling and a drop ceiling. 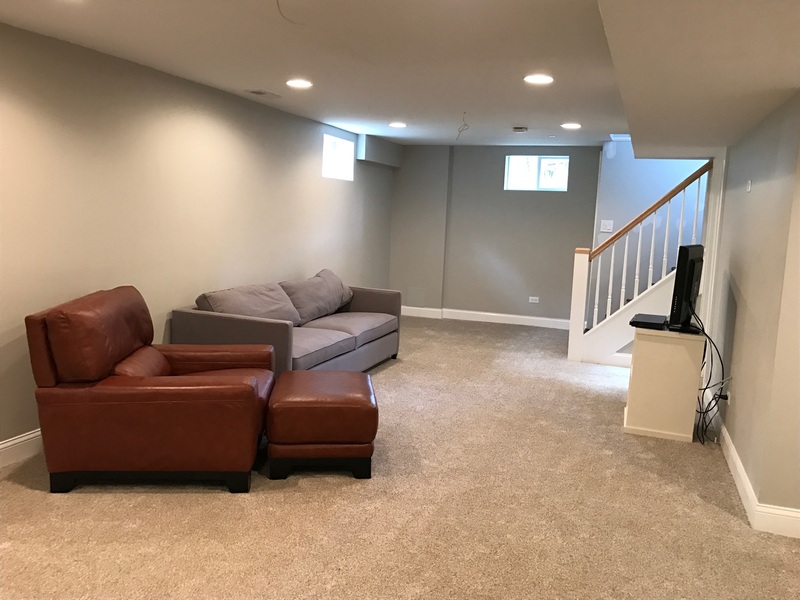 The cubbies are Ikea Kallax, like we have in our playroom. 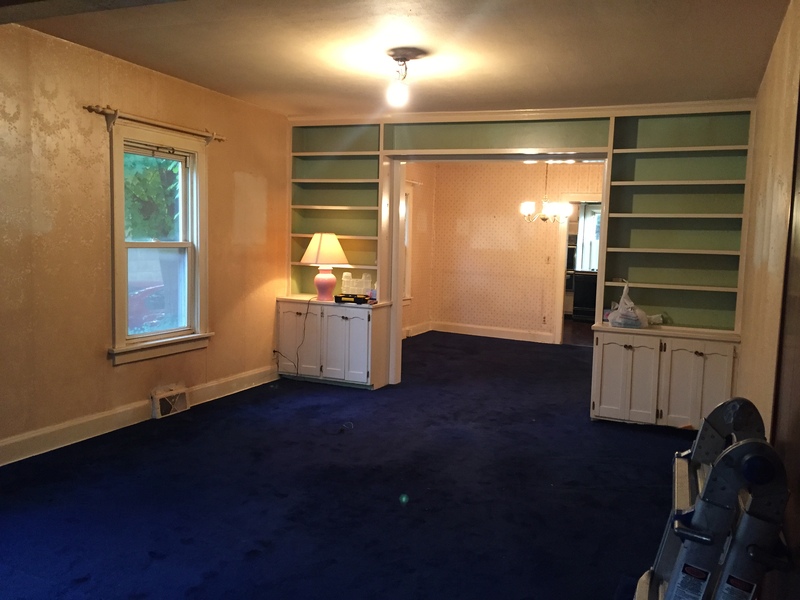 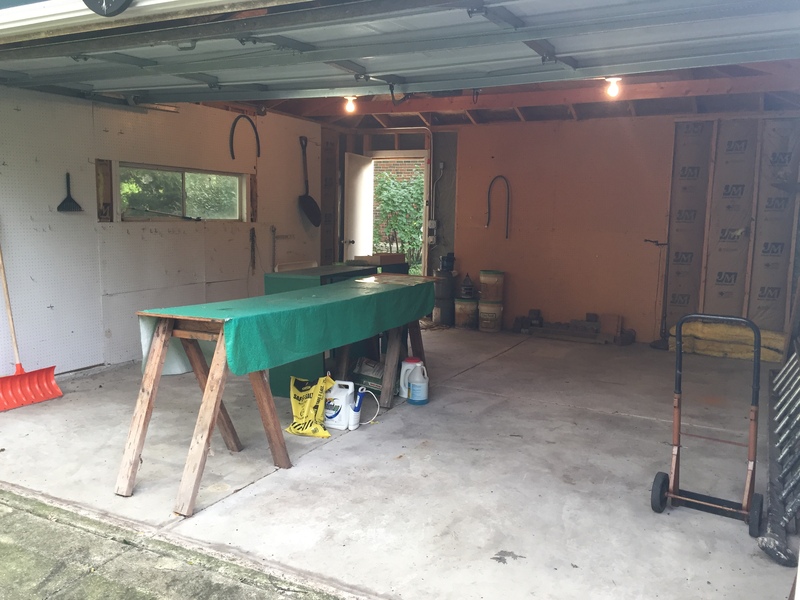 The homeowners have that area set up as a playroom with toys and a chalkboard on the little wall on the left. 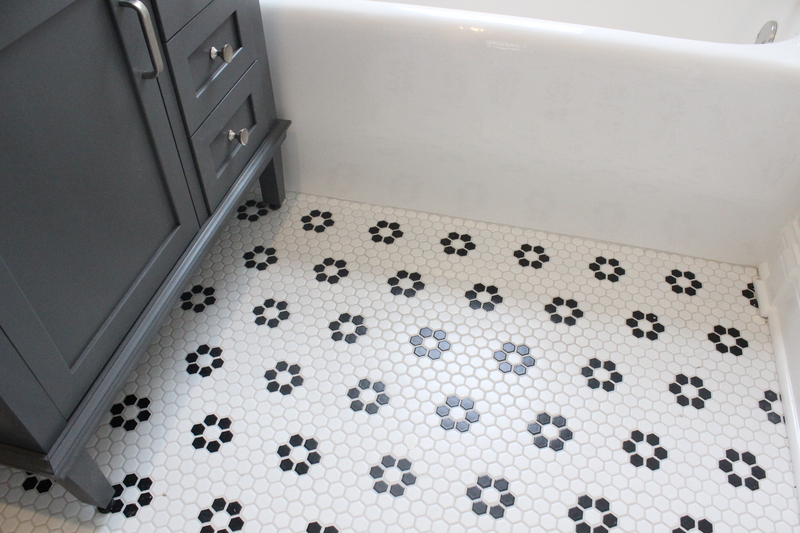 I just love the floor tile that we laid in a herringbone pattern. 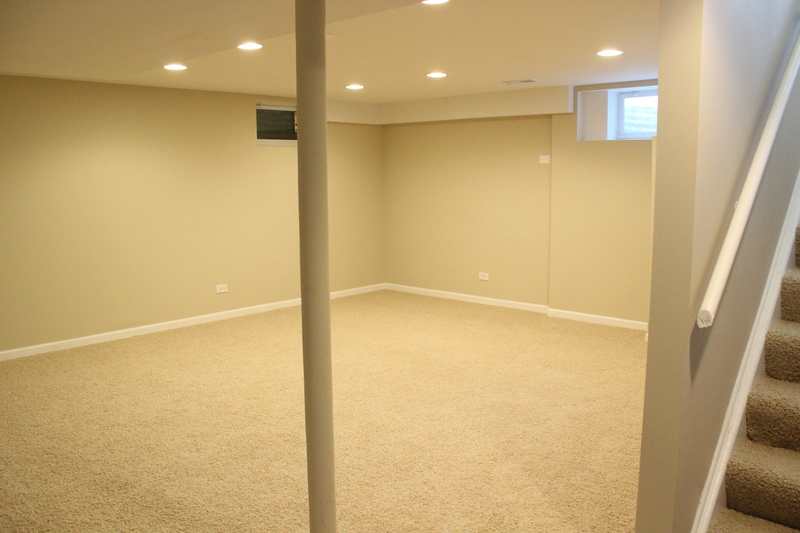 That concludes the tour! 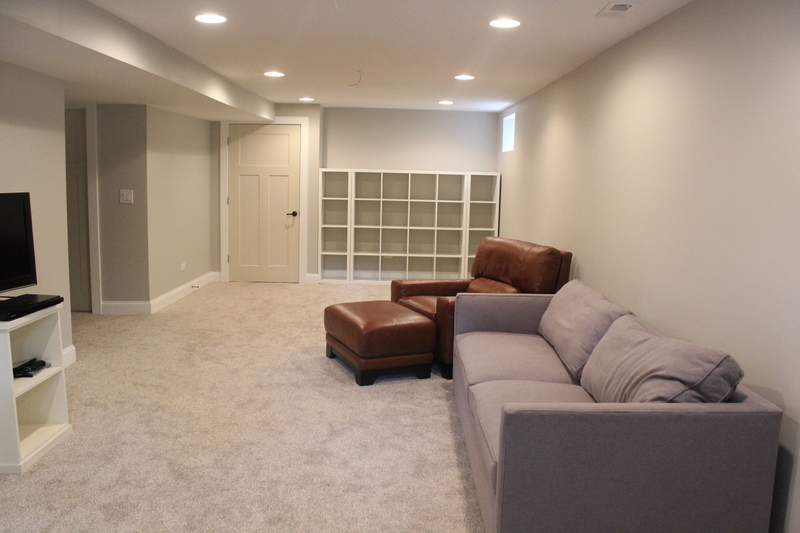 It was a huge undertaking and a ton of work, but it turned out even better than we imagined. 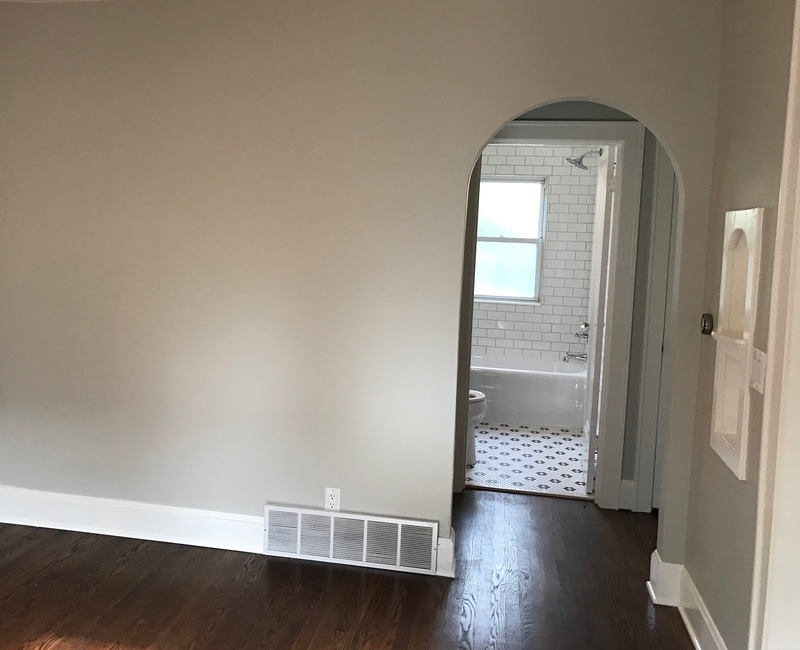 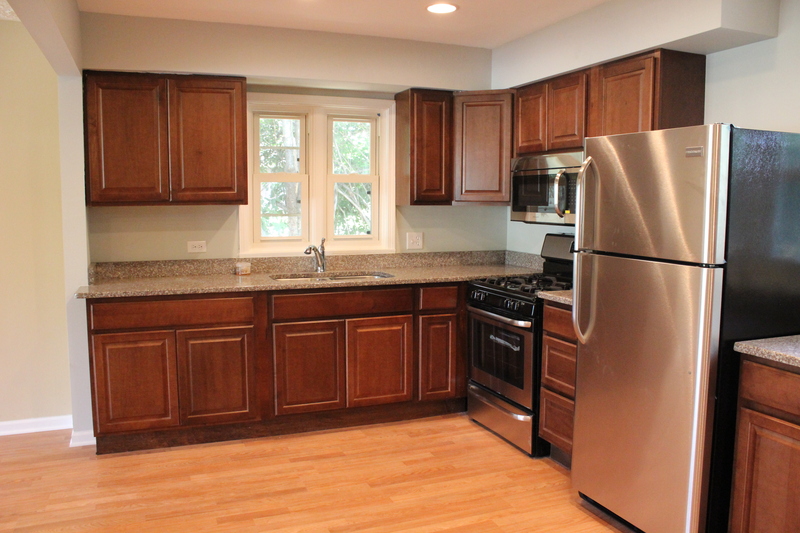 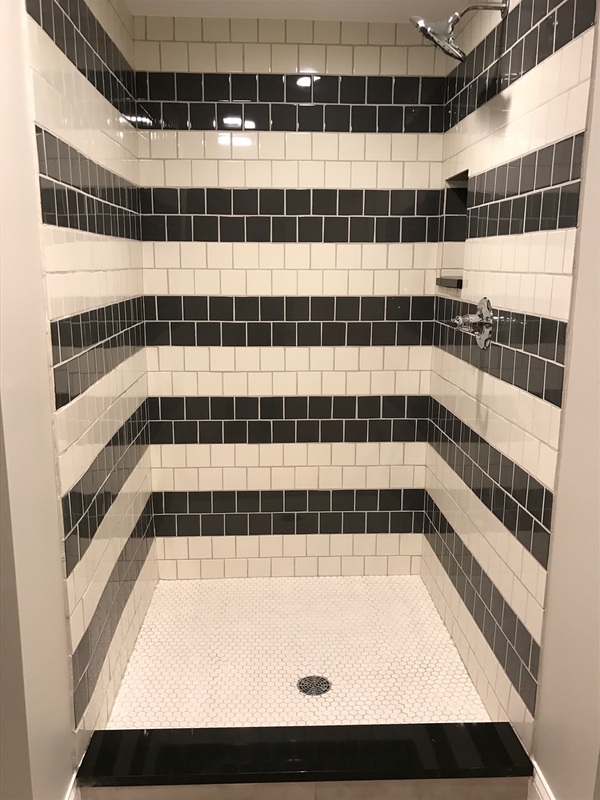 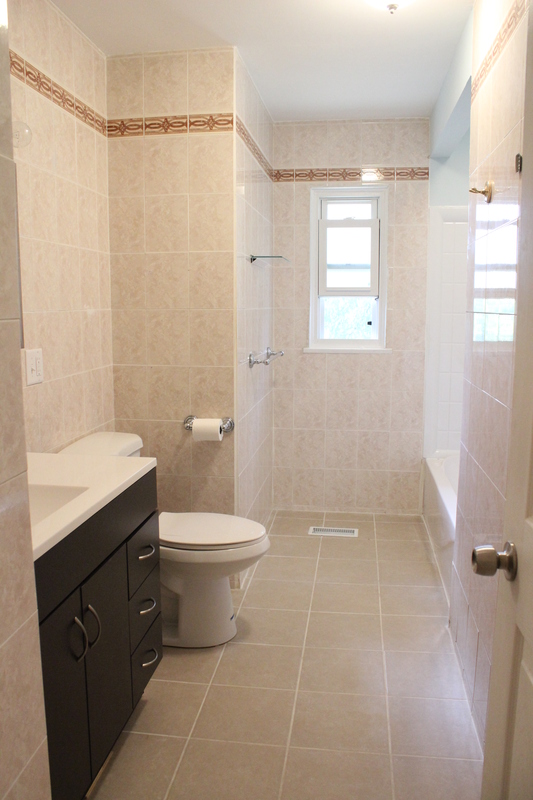 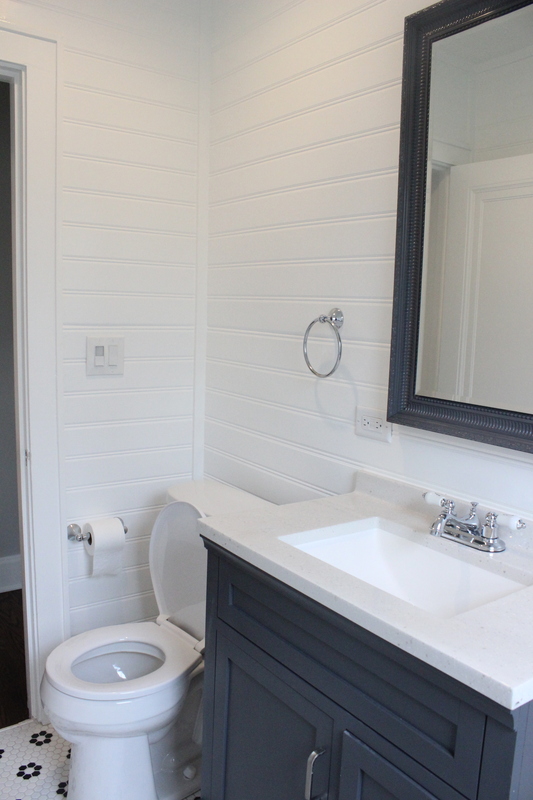 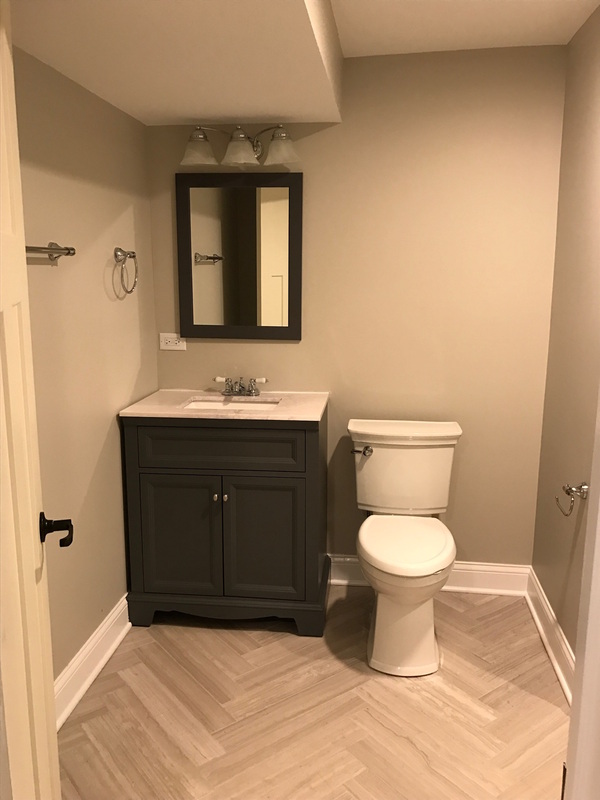 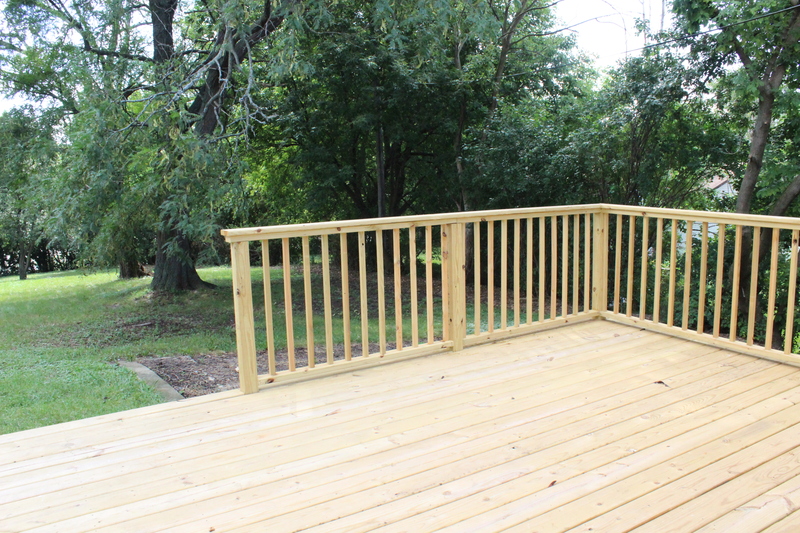 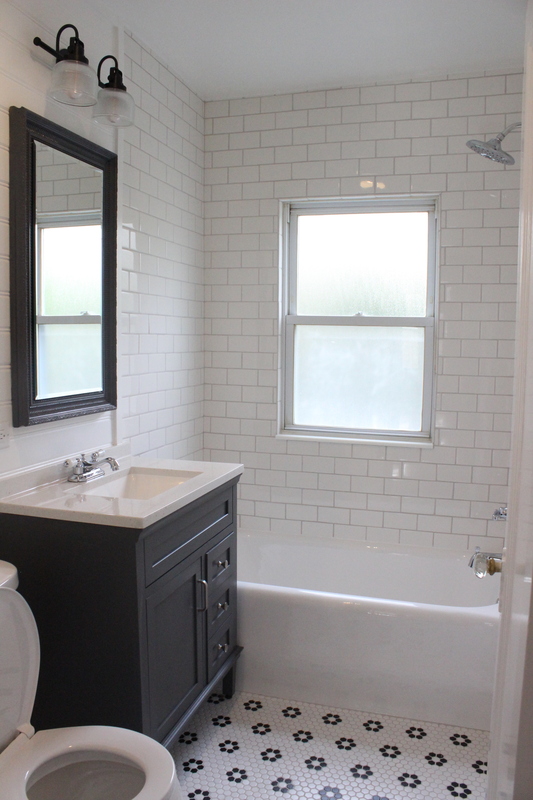 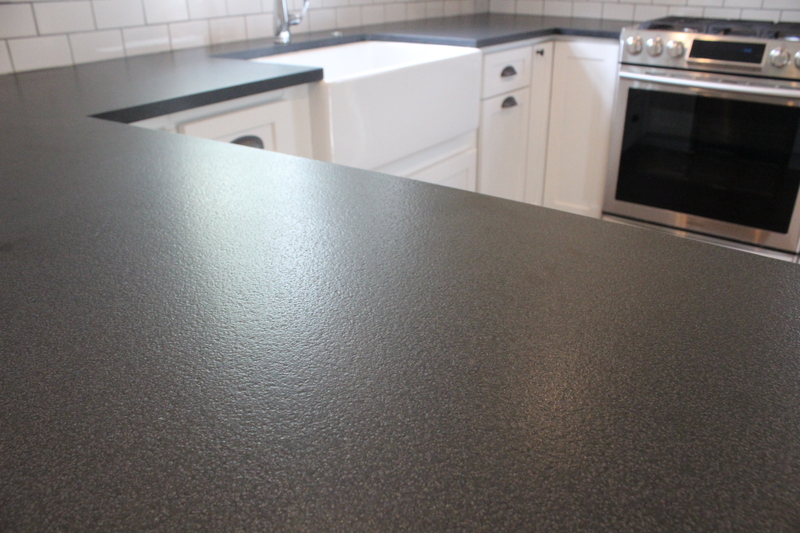 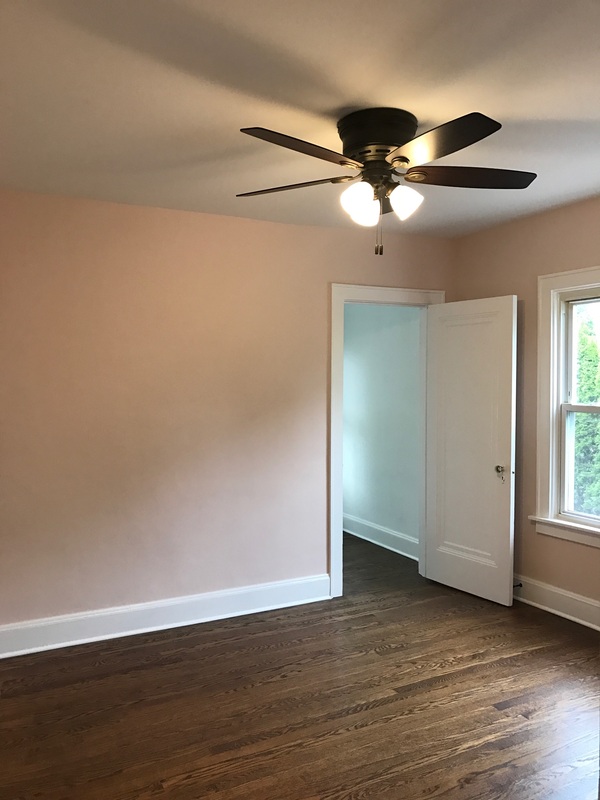 And unlike other flip/rental properties we have renovated, we actually get to enjoy this one AFTER it’s finished because our friends live there. 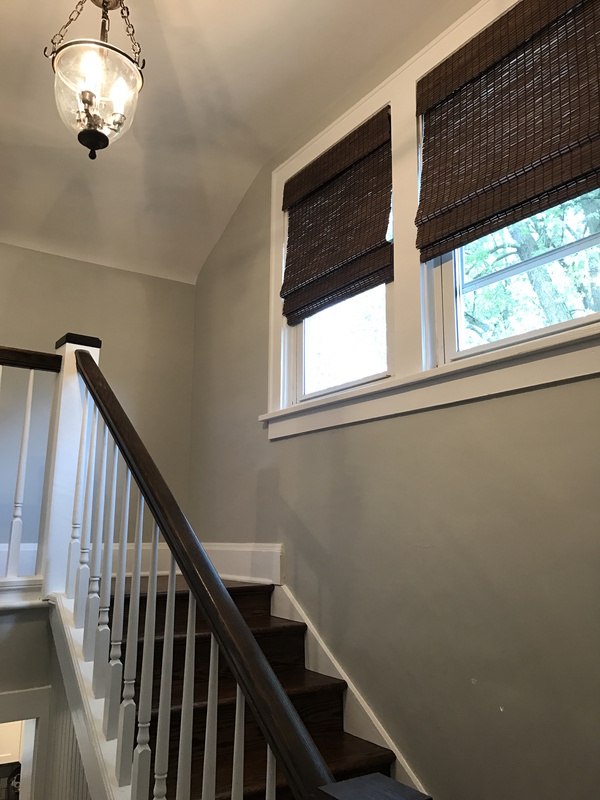 Win, win! 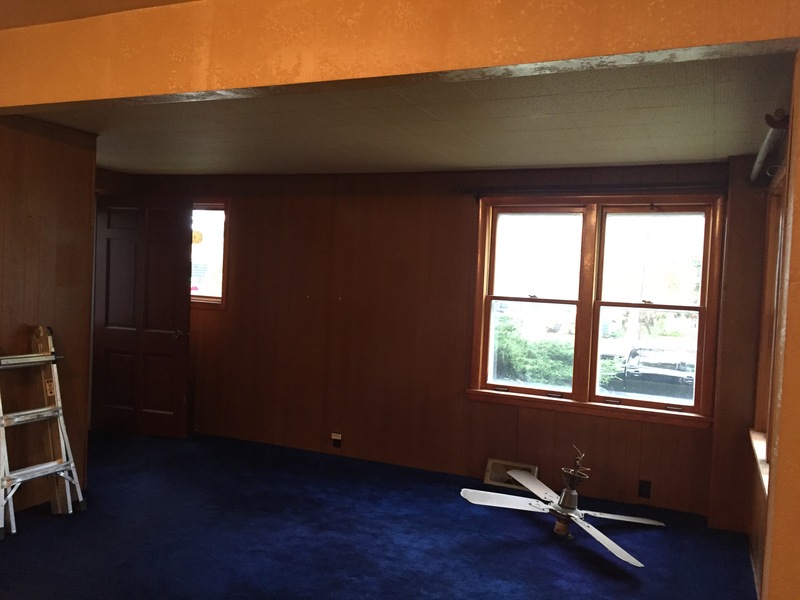 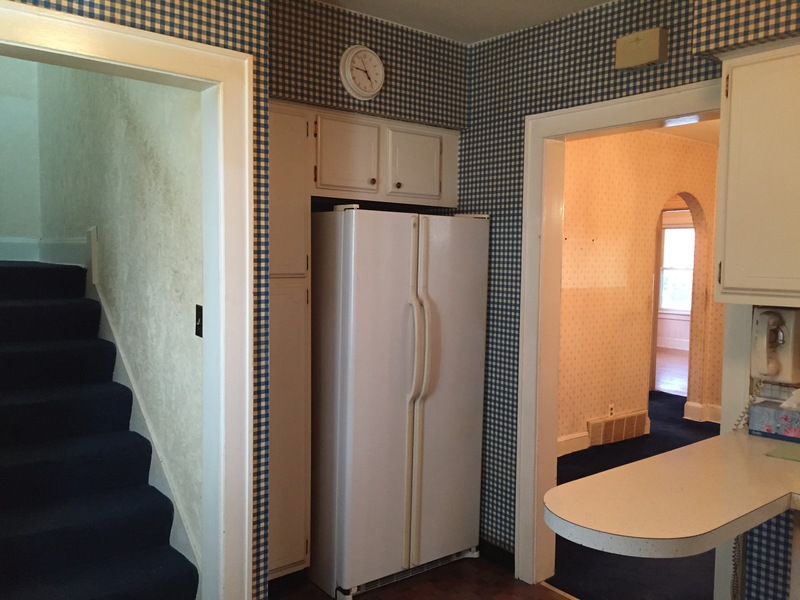 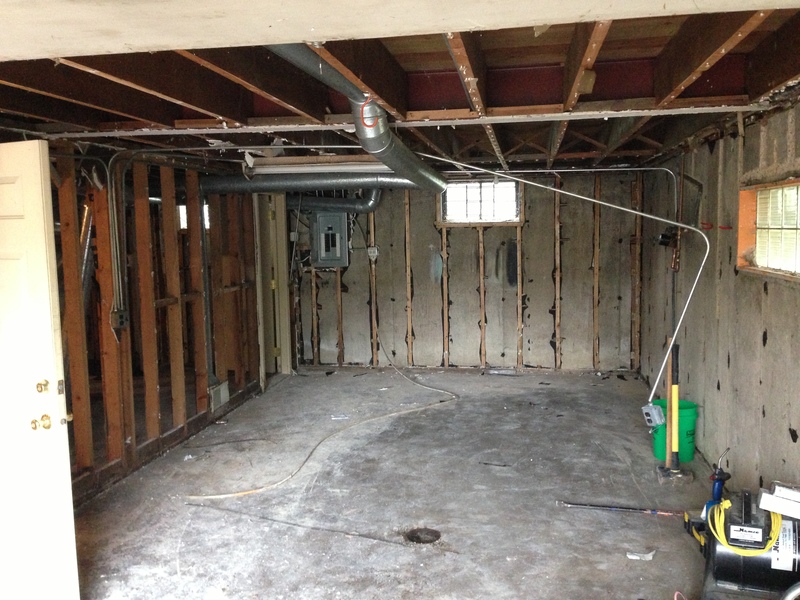 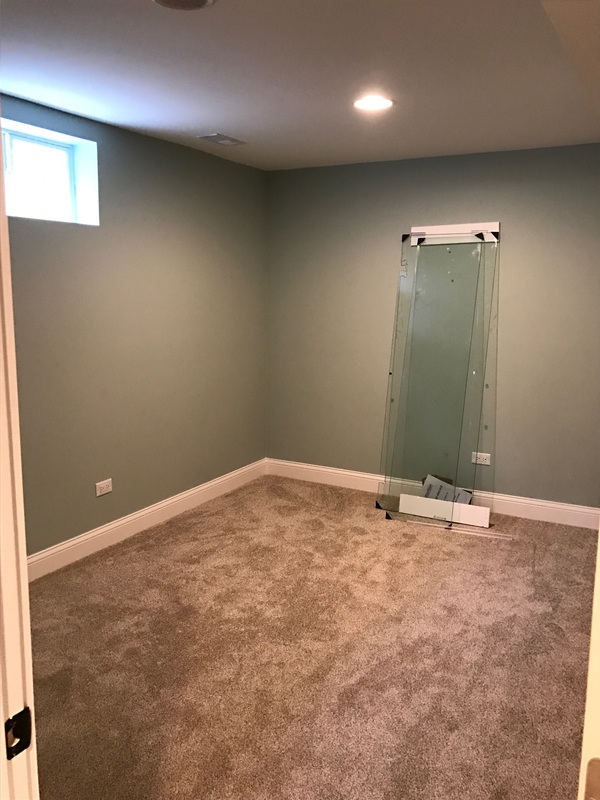 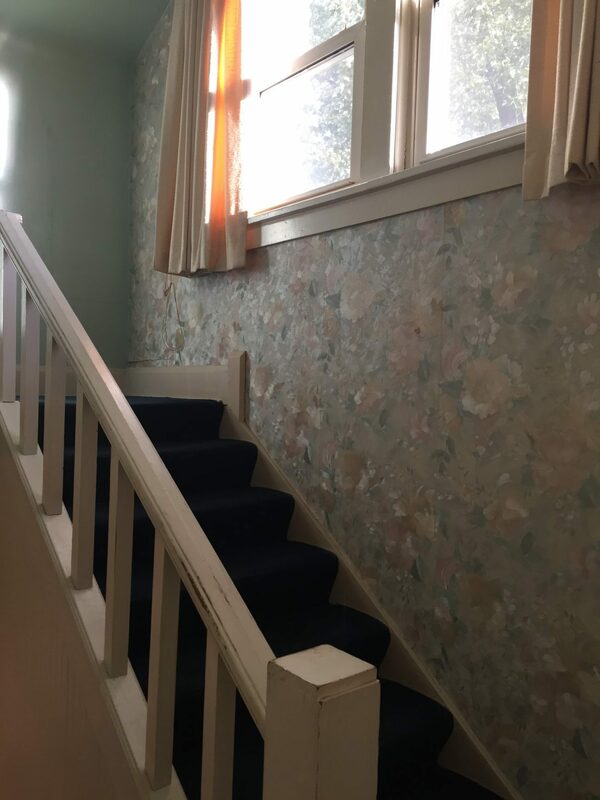 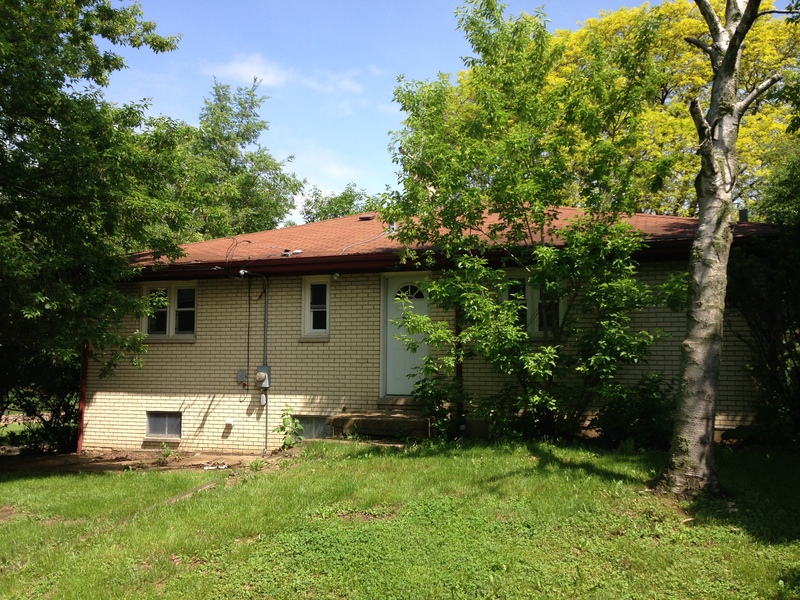 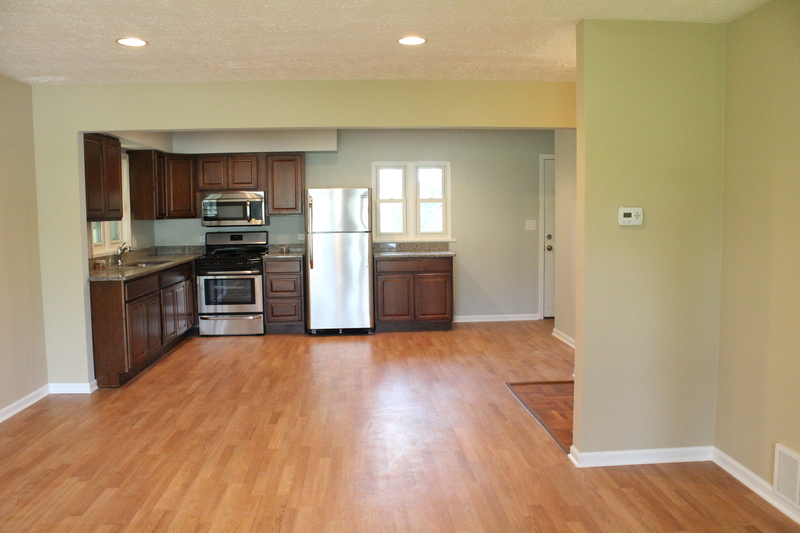 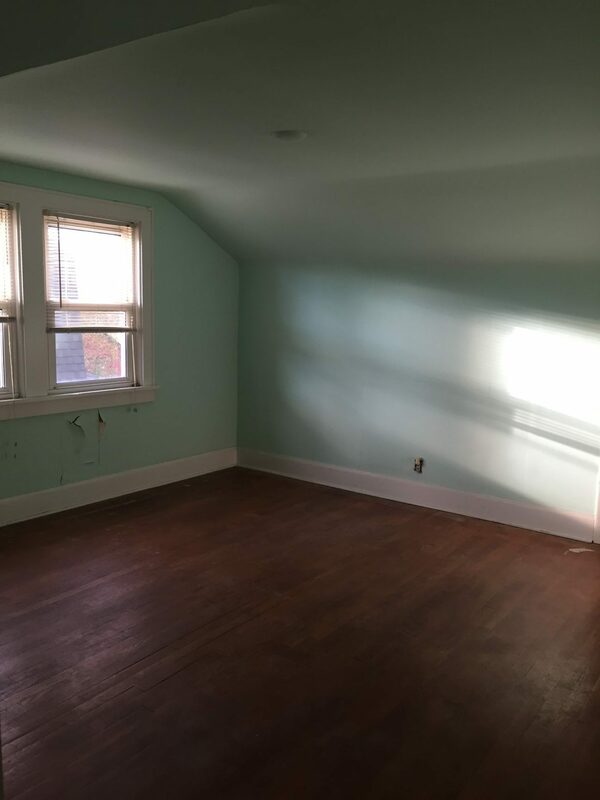 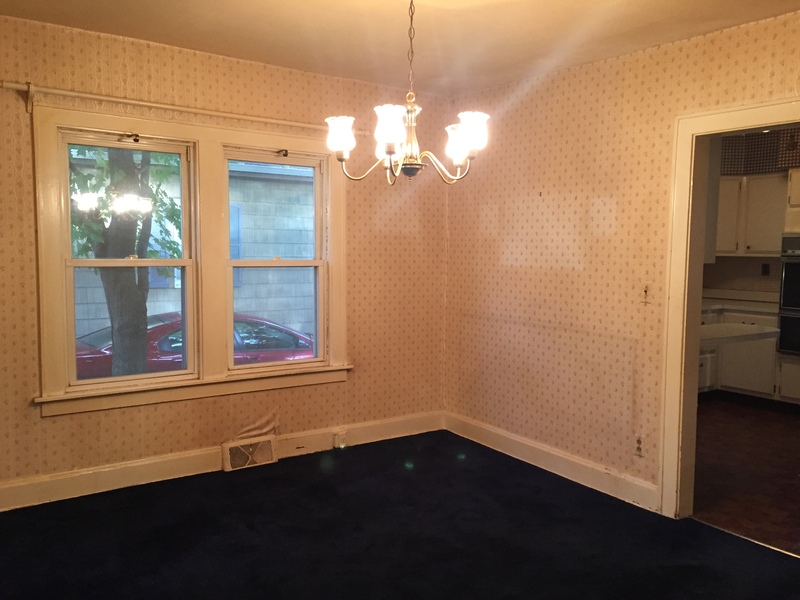 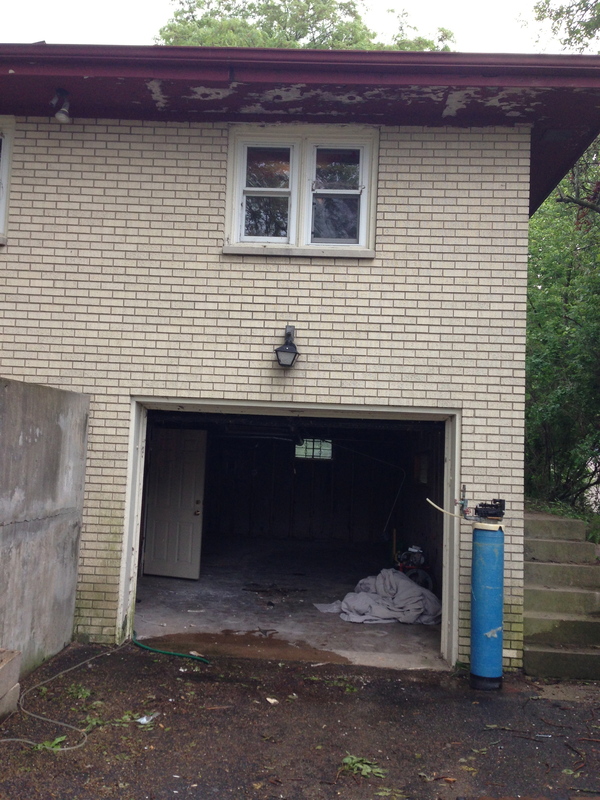 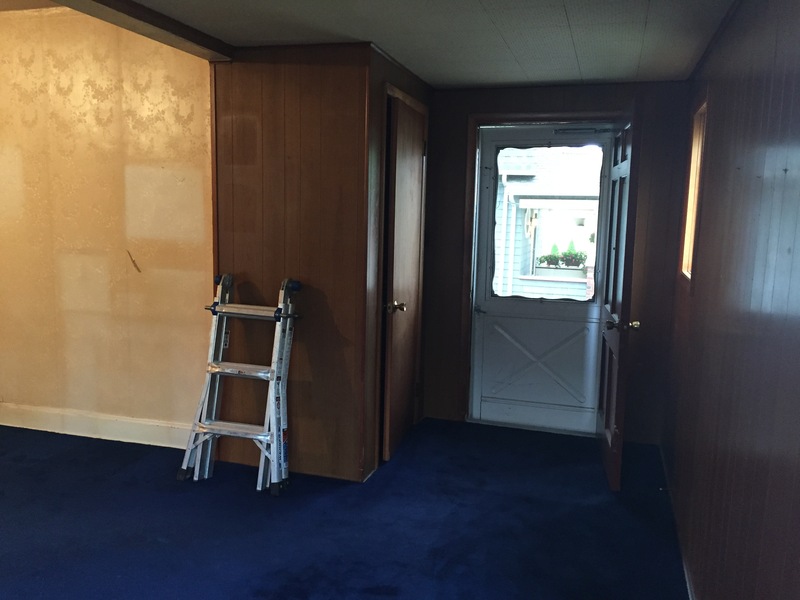 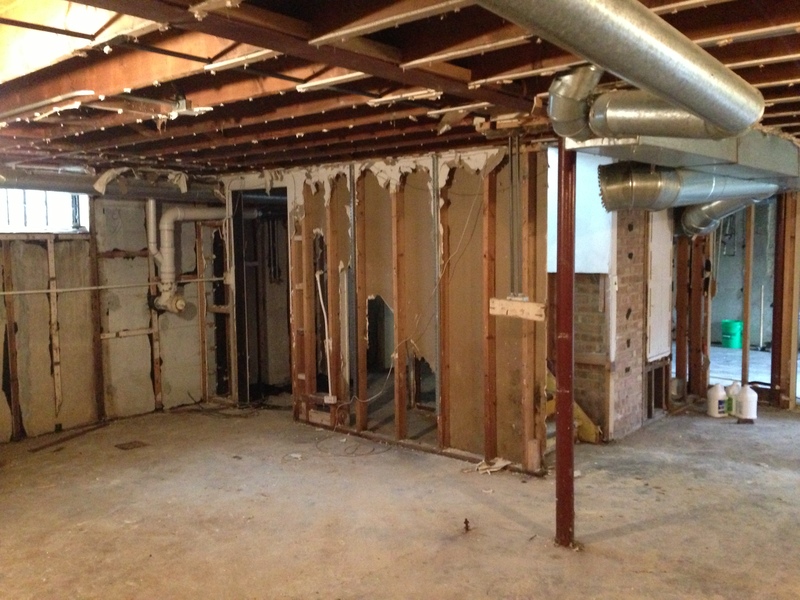 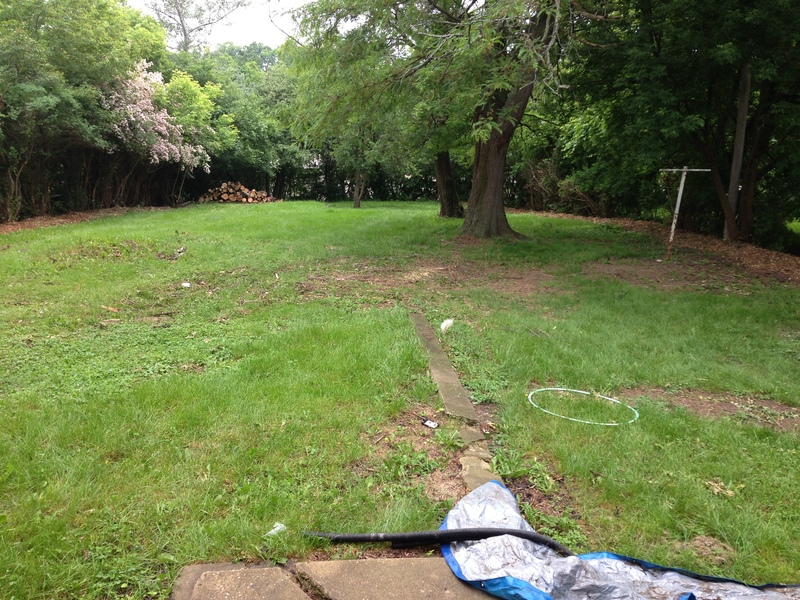 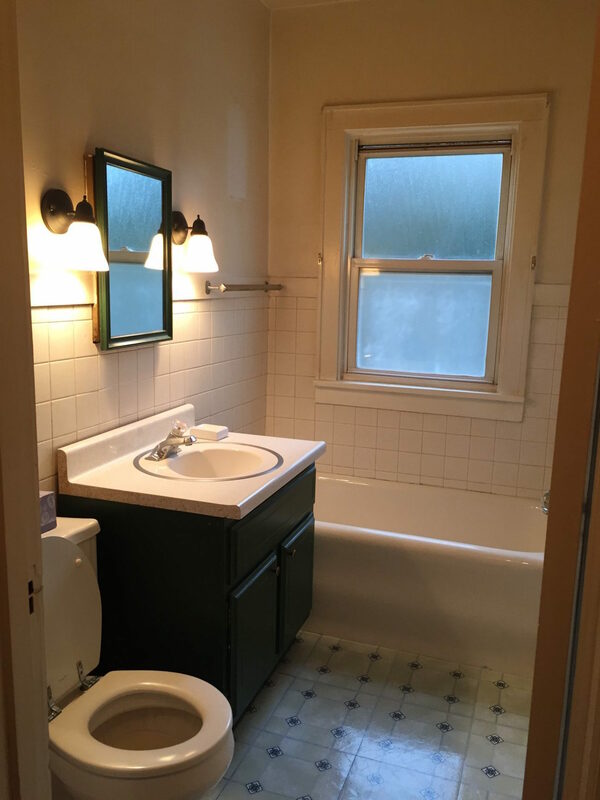 If you’d like to see some of the other properties we have “flipped,” find our rental property renovation here and another “flip” we did 4 years ago here.